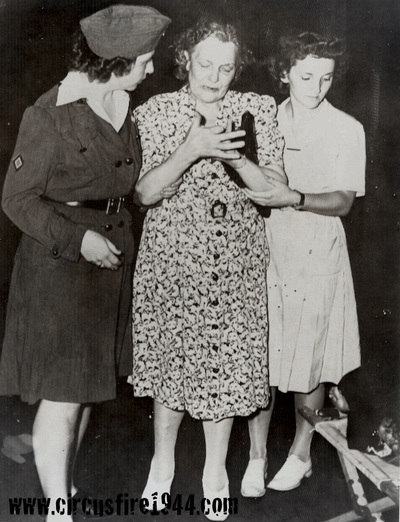 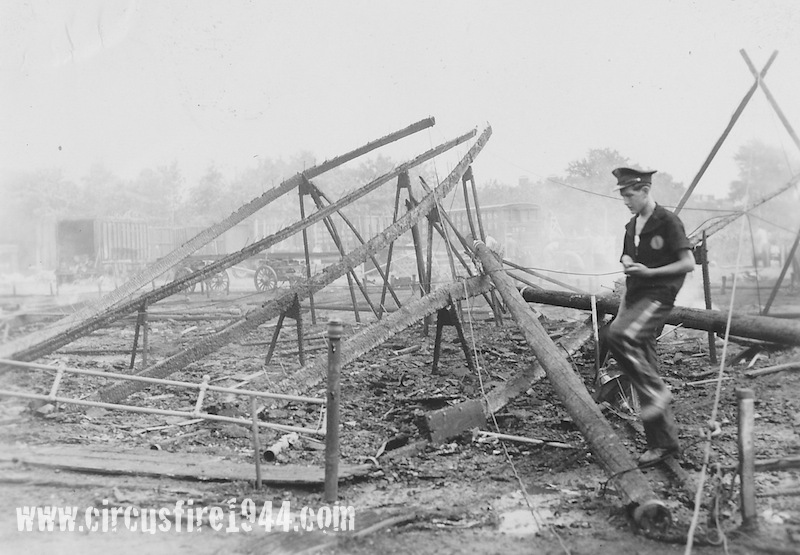 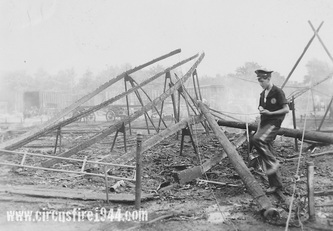 Investigation of the fire scene, photograph by Lieutenant Frank Shaw of the Connecticut State Police. 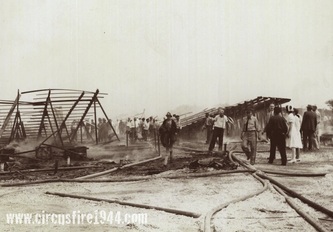 Origin of the fire. 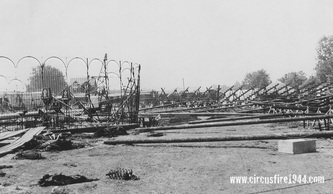 Remains of the men's toilet enclosure can be seen, and the charring pattern on the bleacher supports are visible. People search for personal belongings among the charred debris. A uniformed young man makes his way through the burned remains. 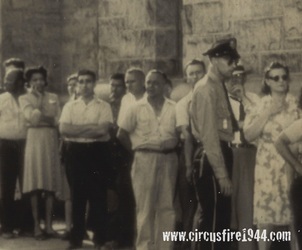 A large crowd gathers at the fence around the lot. 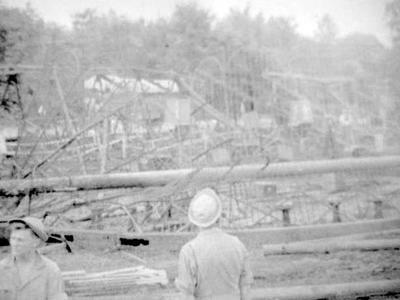 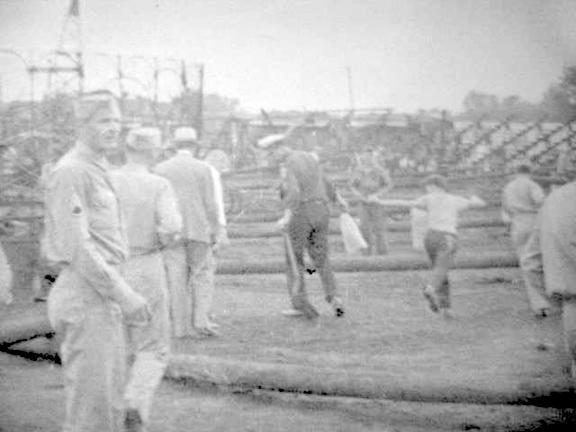 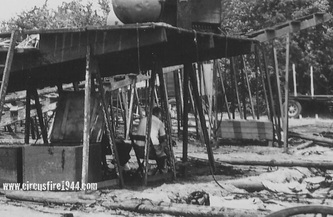 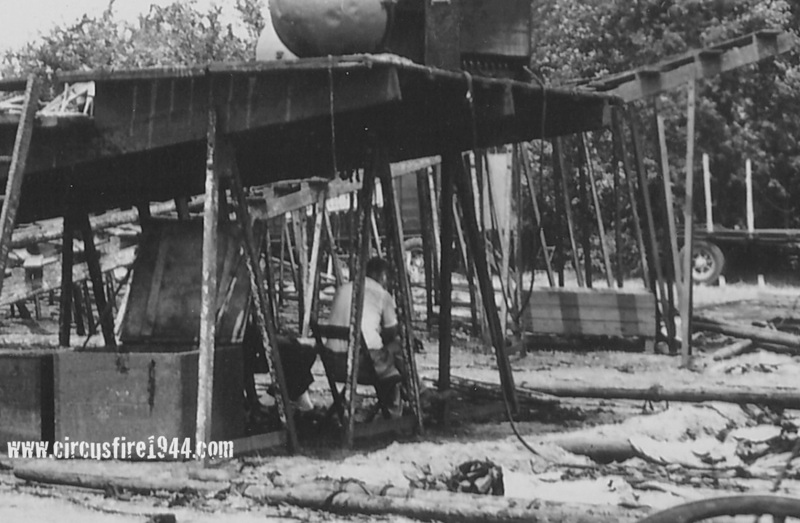 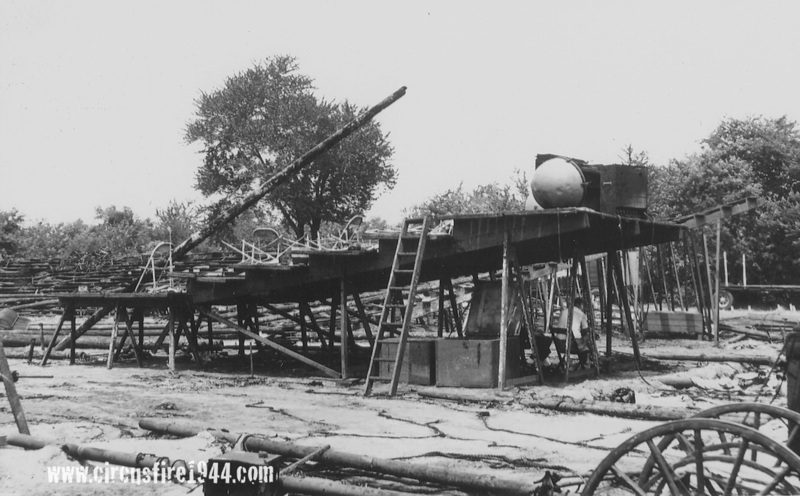 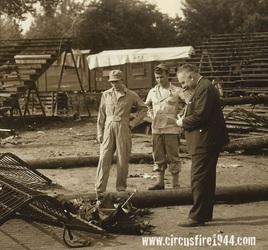 An inspector takes notes next to the fallen animal chutes. Notice the pile of shoes next to chutes. 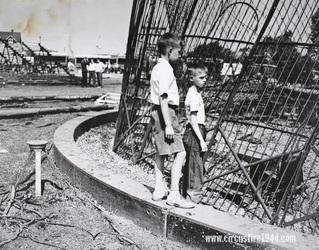 Survivors Leo Goodman, age 9, and Nicholas Zaccaro, age 11, inspect the ruins after the fire. 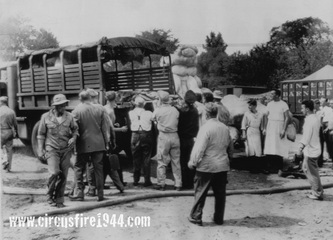 Men from nearby Bradley Field Air Base load the victim's bodies onto an Army truck for transport to the State Armory morgue. 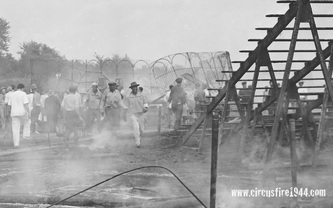 Photo courtesy of Donald Derby. 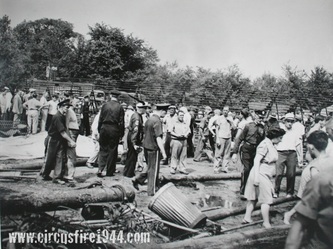 Photo courtesy of Henry Hallock. 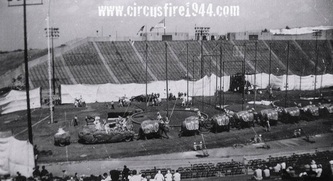 View from South end of the big top. Charred grandstand seating in on the left, animal cage at ring 1 is to the right. A collapsed animal runway chute is also shown beneath a fallen center pole. 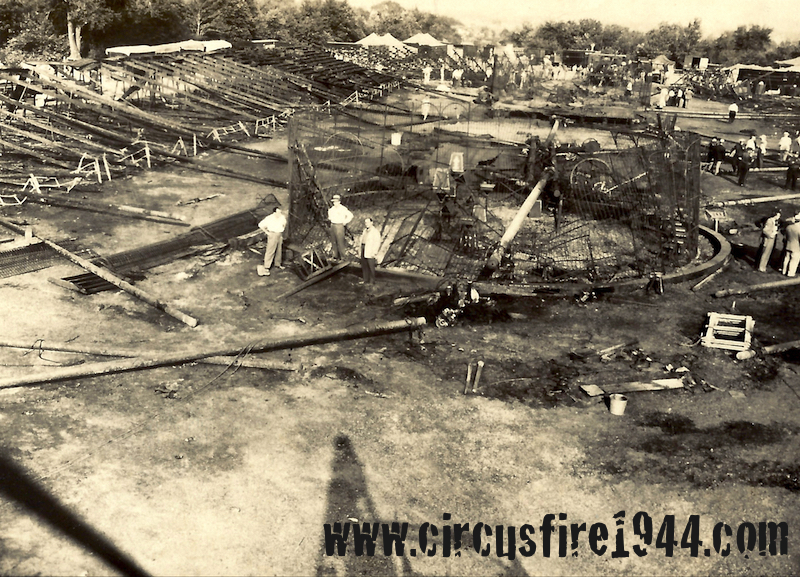 View from the East end of the tent looking Southeast at the remains of the bandstand area. 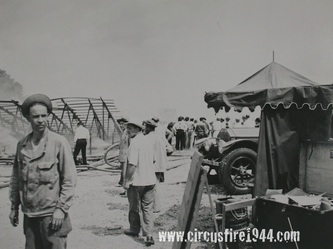 Performer's Dressing Tent in the background. View from the East end of the tent looking Southeast at the remains of the bandstand area. 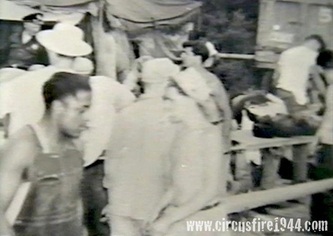 Performers Dressing Tent in the background. 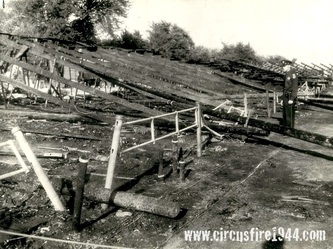 Opposite end from origin of fire, remains of the bandstand area. View from East end of tent looking Northwest. 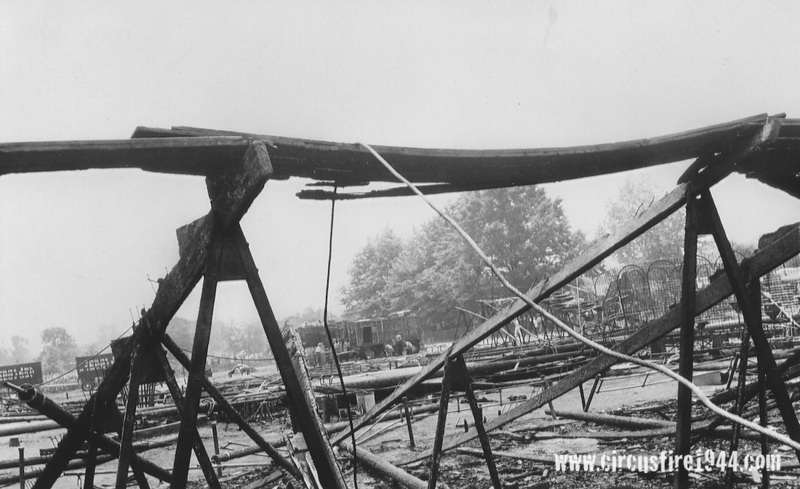 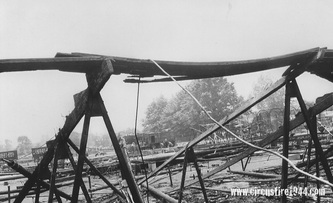 An investigator can be seen scraping charred supports. 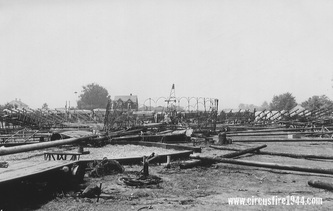 Standing at West end of tent, near the Main Entrance, looking East. 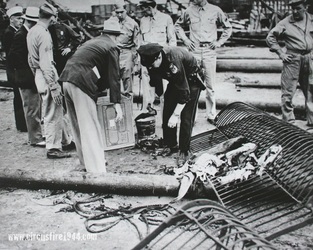 Workers appear to be removing the remains of a victim from the fire scene. 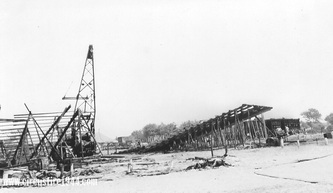 View from the Main Entrance area, looking east, possibly taken from someone on the crane (which can be seen in shadow). 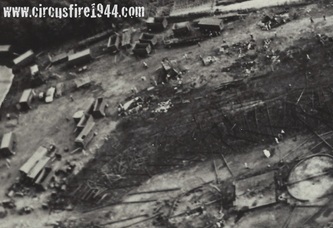 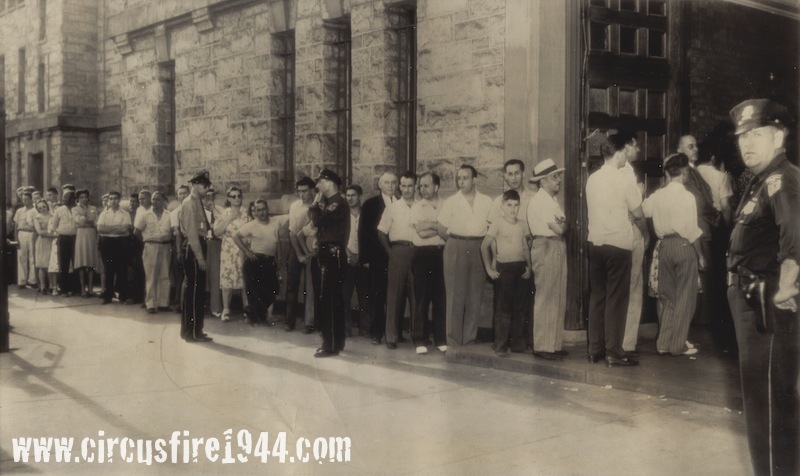 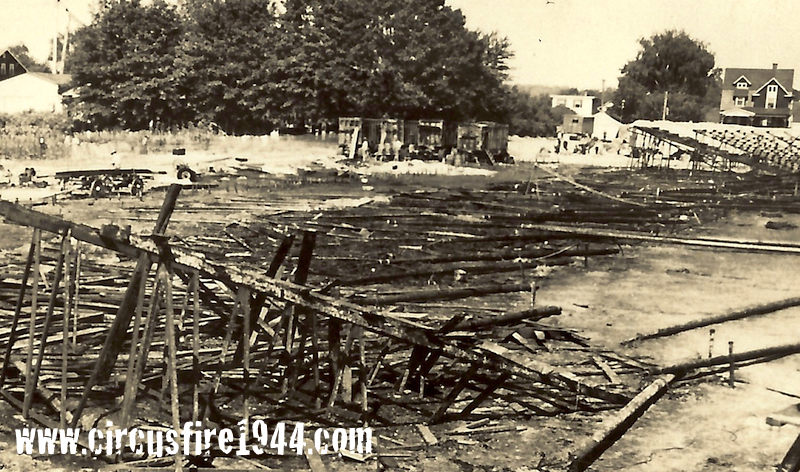 Photo was taken very soon after the fire, with a lot of people and activity at the east end of the lot (top of photo) where the deceased were loaded into trucks for transport to the State Armory morgue. 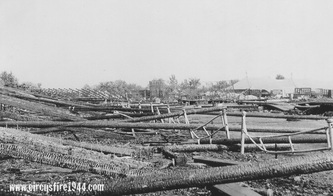 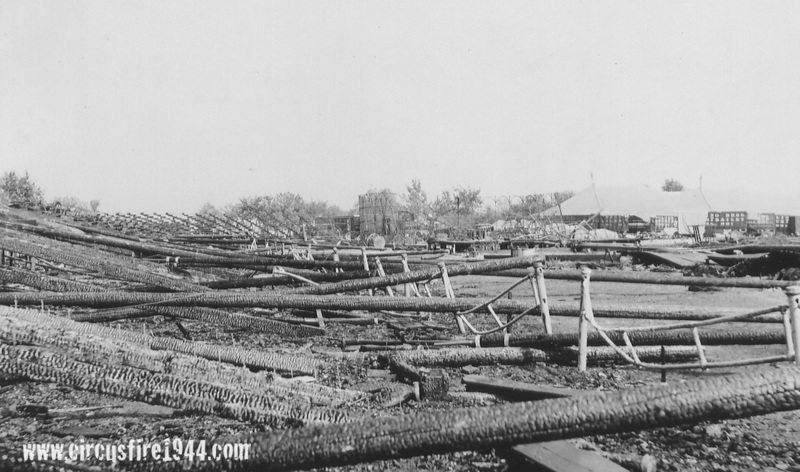 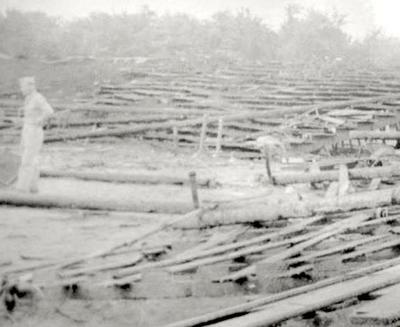 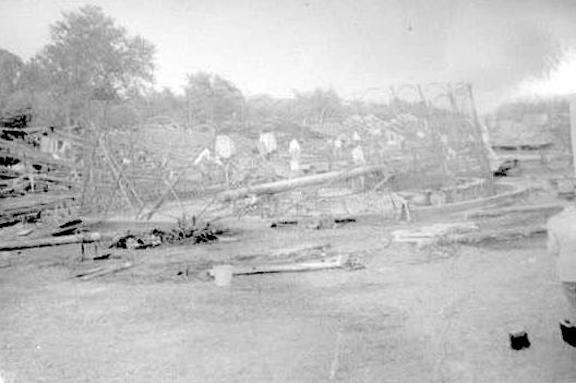 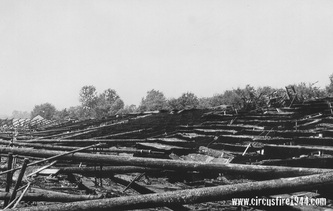 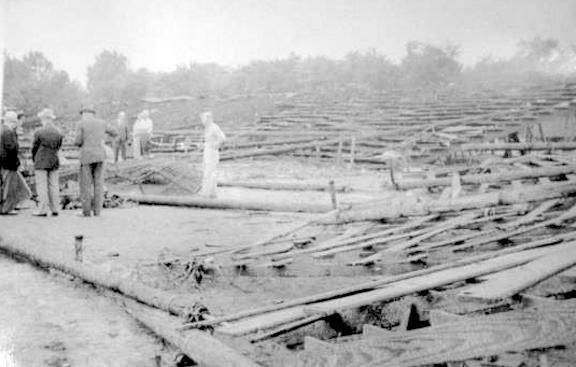 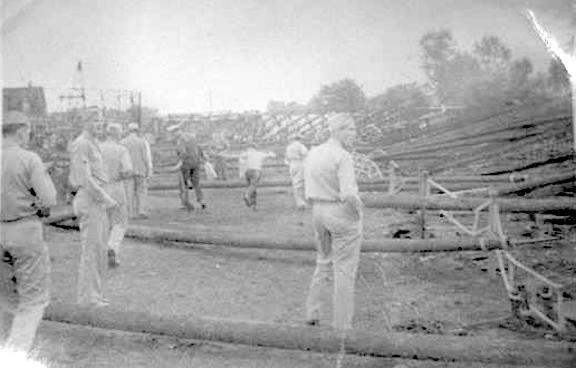 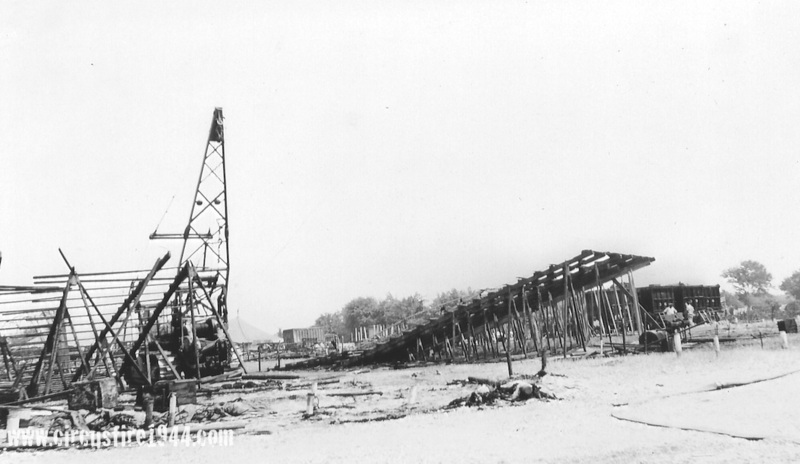 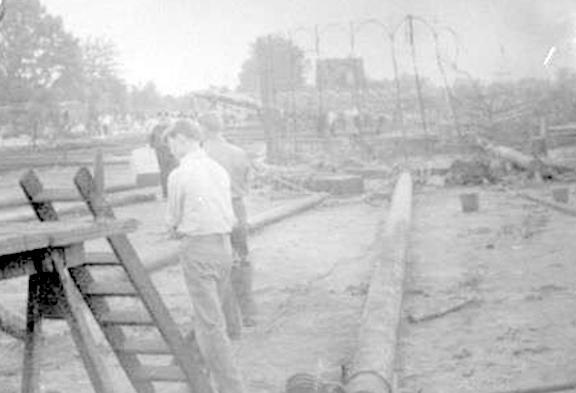 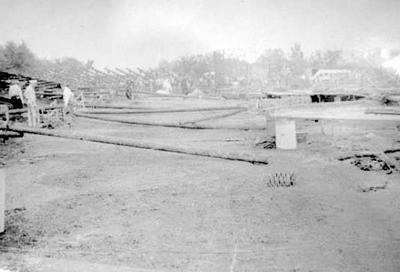 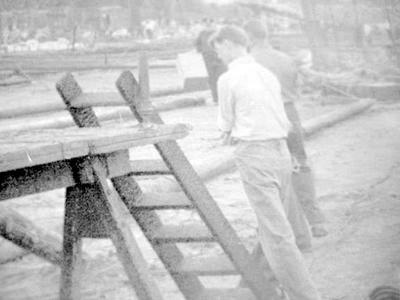 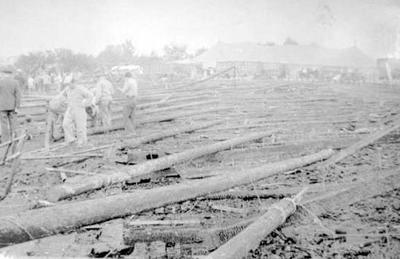 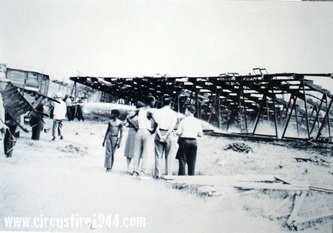 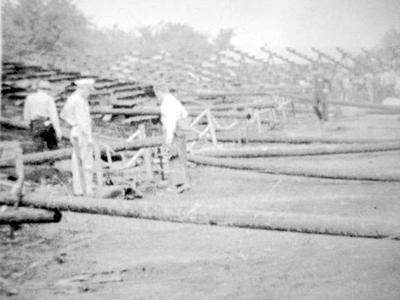 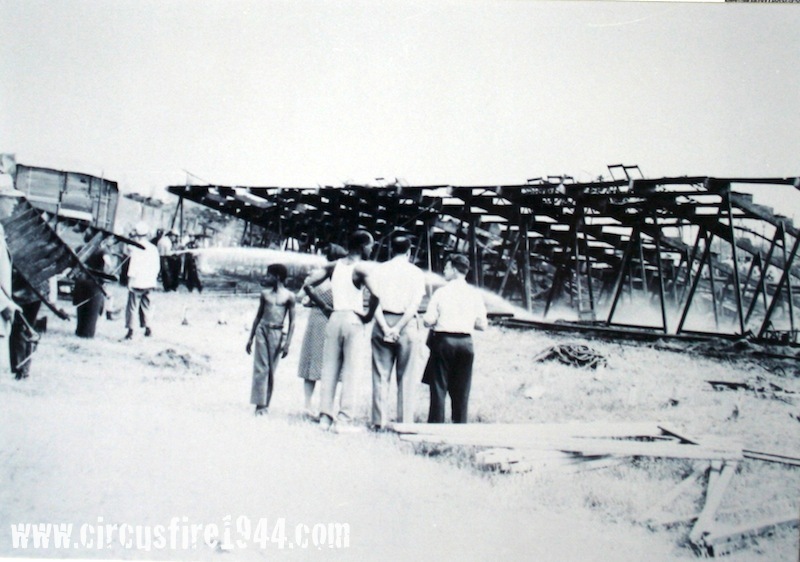 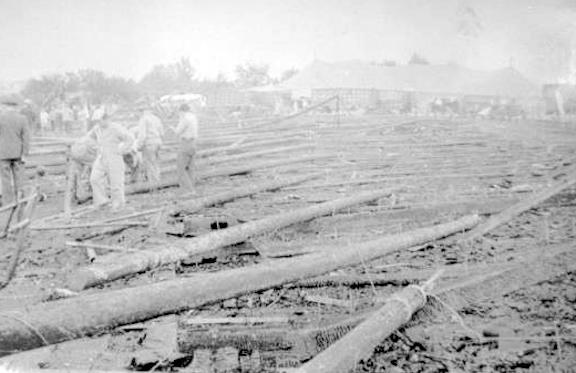 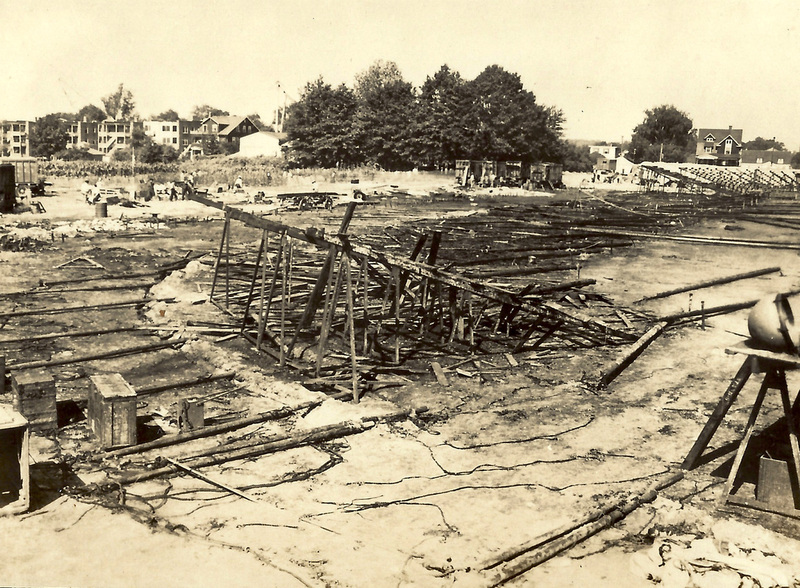 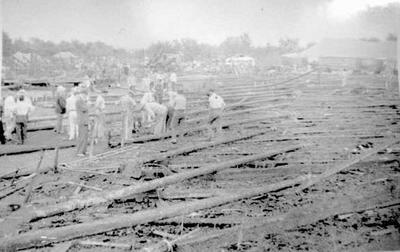 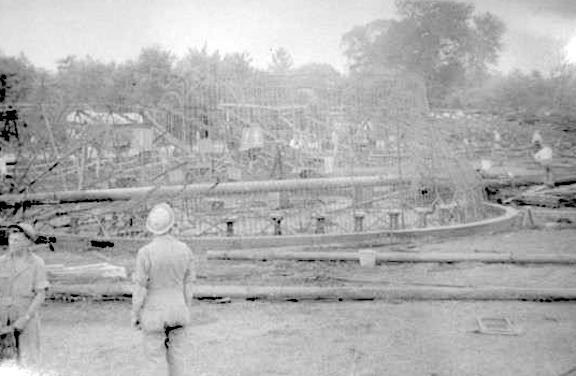 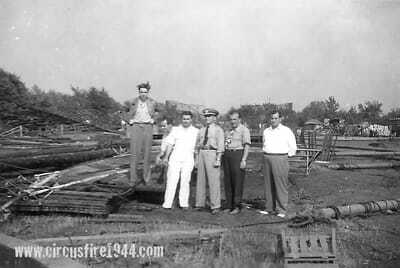 Close-up of the Northwest animal runway, collapsed, on left side of the photo next to the 3 men. 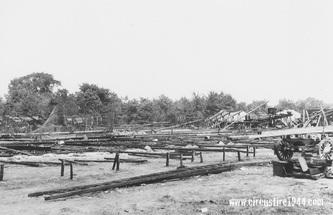 Close-up of the back lot area, at the east end. Circus wagons visible, and trucks for transporting the dead. 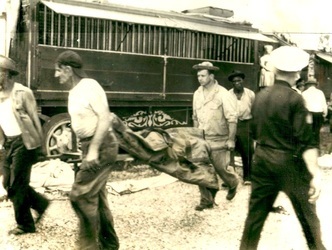 Scores of workers are helping to collect and load the bodies. 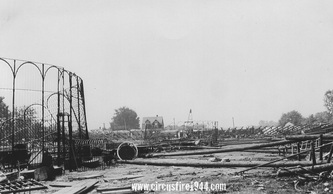 View from the back lot looking west toward Barbour Street. 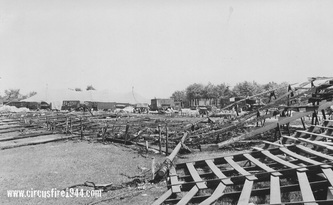 Merle Evans' bandstand is the structure in the center of the photo. 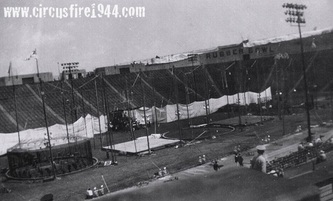 The Main Entrance would at the far end of the tent, to the upper right in the photo. 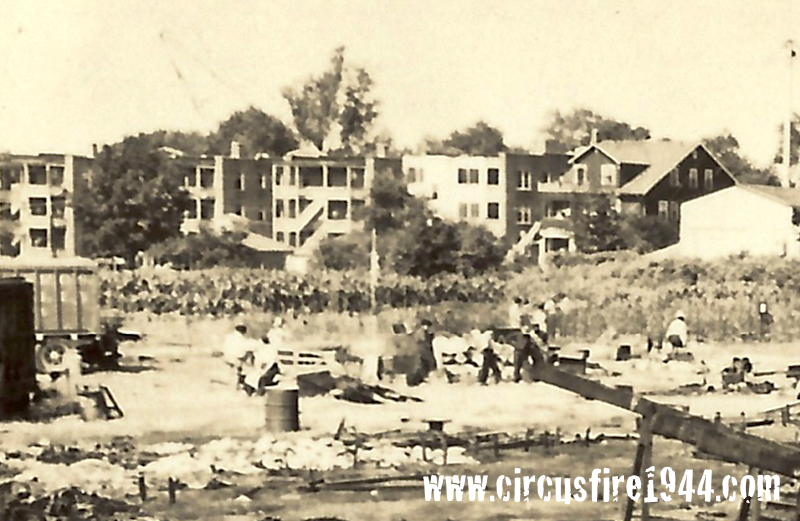 The victory gardens are to the left, and a couple of homes on Barbour Street can be seen at the top of the photo. 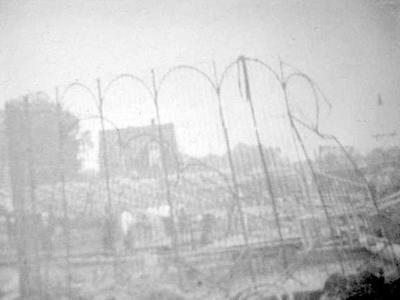 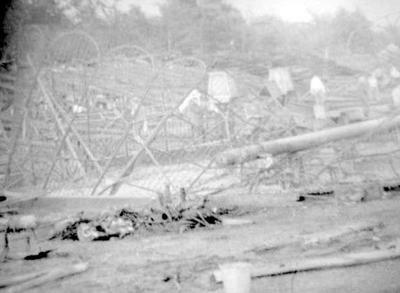 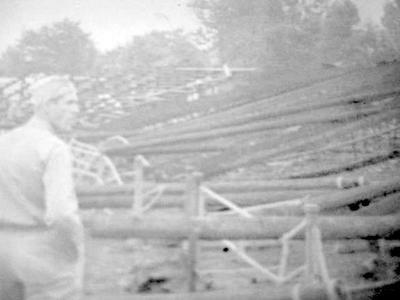 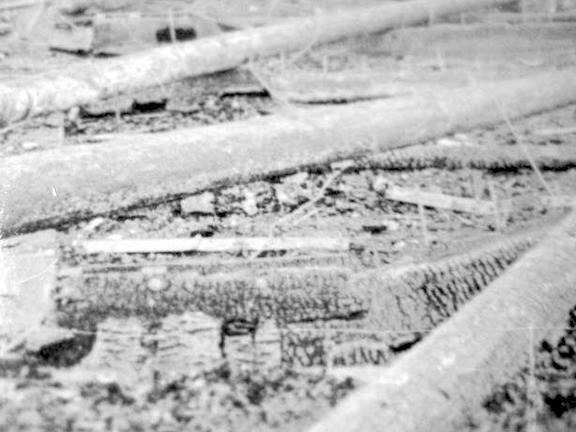 Close-up of two unknown people surveying the ruins of the bandstand. 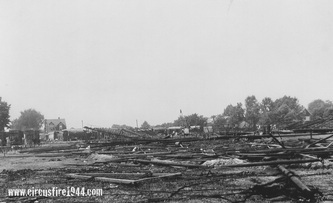 View from east end looking southwest. 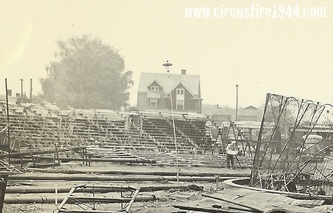 Bandstand in foreground to the right of the photo, Southeast bleachers in the center of the photo. Victory gardens are to the left, and the homes along Barbour Street are visible at the top of the photo. 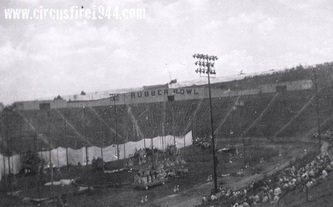 Close-up of charred Southeast bleacher section in foreground, and total destruction of the South grandstand seats (Sections A thru K). 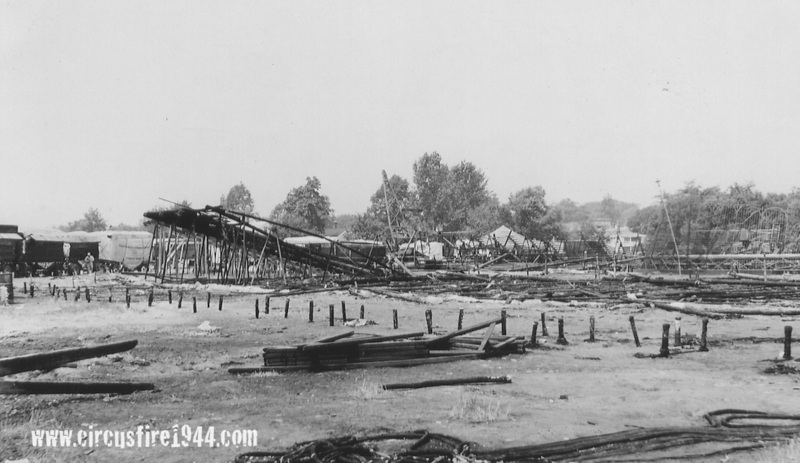 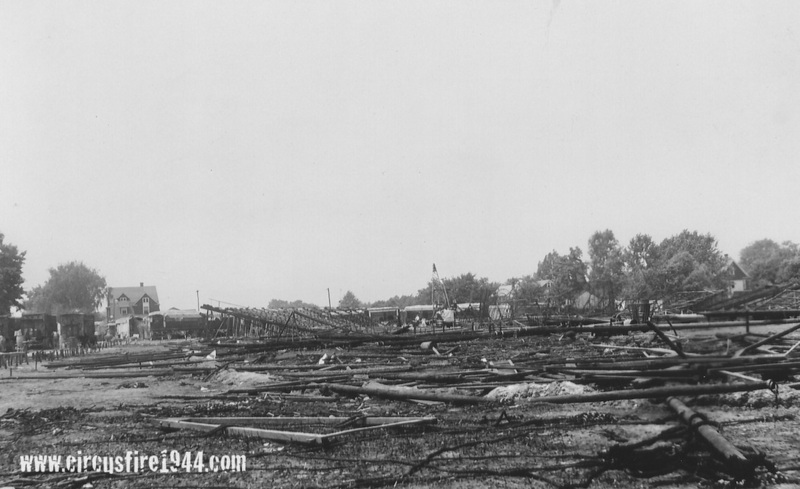 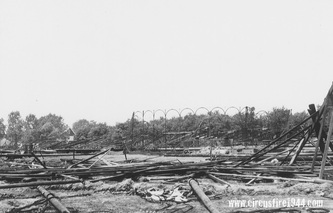 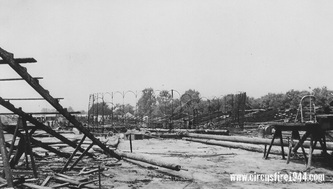 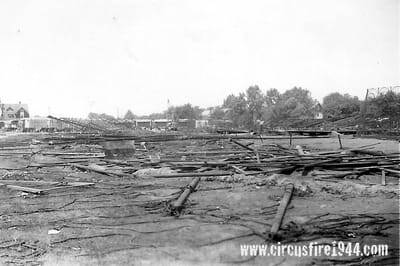 Beyond the grandstand ruins are the remains of the Southwest bleachers, upper right in the photo, where the fire originated. Close-up of the backside of homes along Barbour Street. 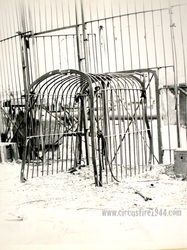 Some of these still remain at 298 - 314 Barbour Street. 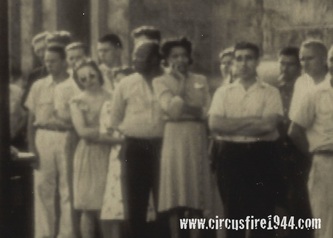 Friends and family of victims of the circus fire waiting to identify their loved ones. 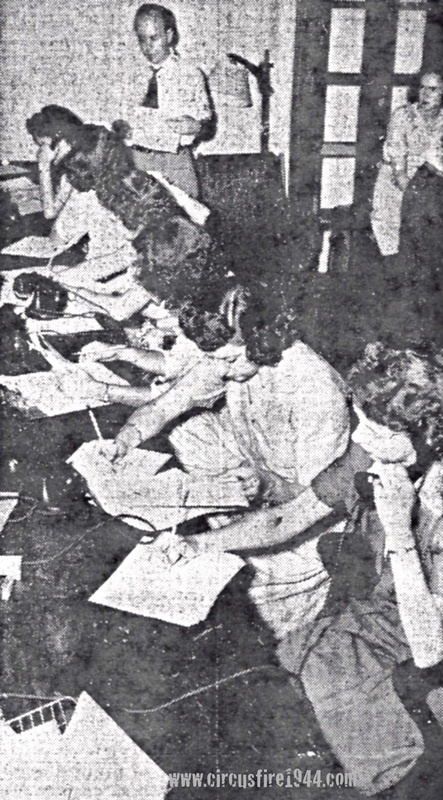 Information desk at the temporary morgue at the Connecticut State Armory. 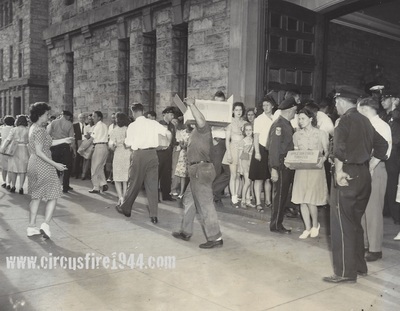 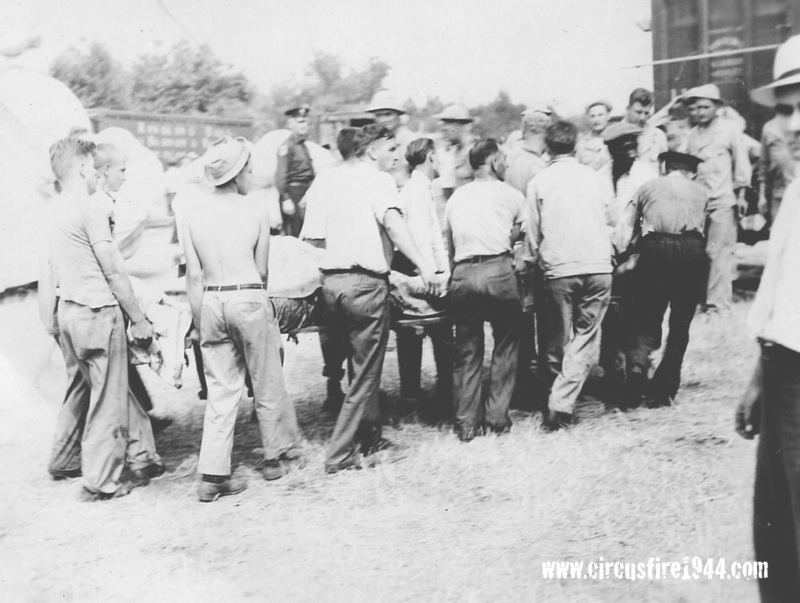 Bodies of the circus fire victims wait to be identified at the Connecticut State Armory morgue. 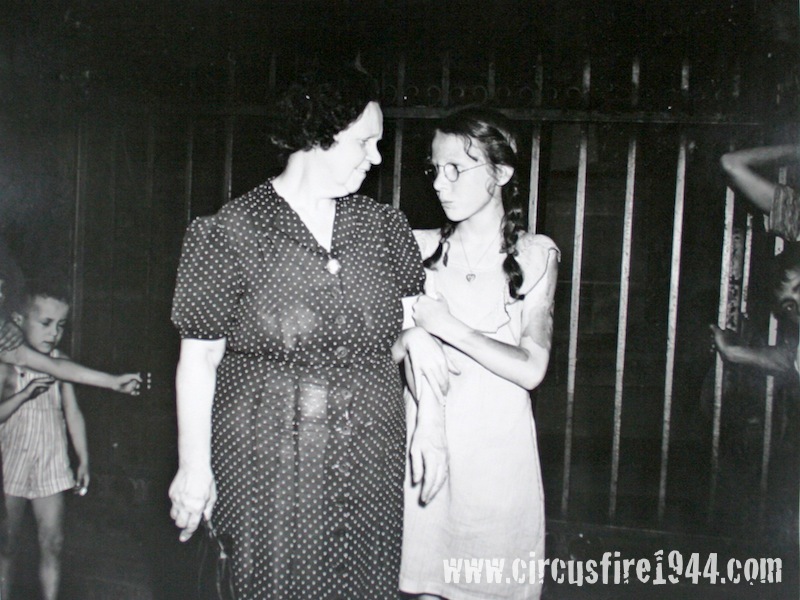 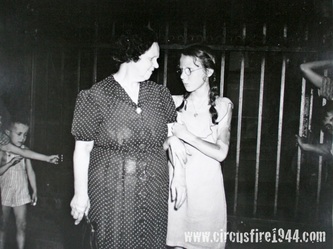 Mother and daughter reunited after the fire. 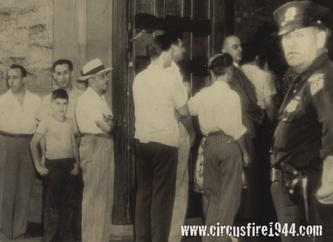 Photo was possibly taken at The Brown School, where the lost children were collected. 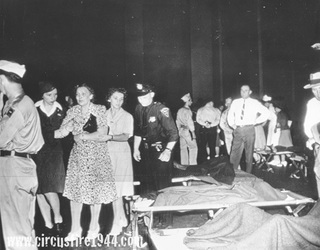 A distraught woman is aided by nurses and police while trying to identify lost loved ones. 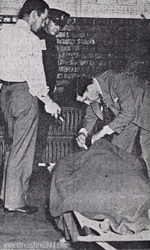 Policemen arrange the bodies in the temporary morgue at the Connecticut State Armory. 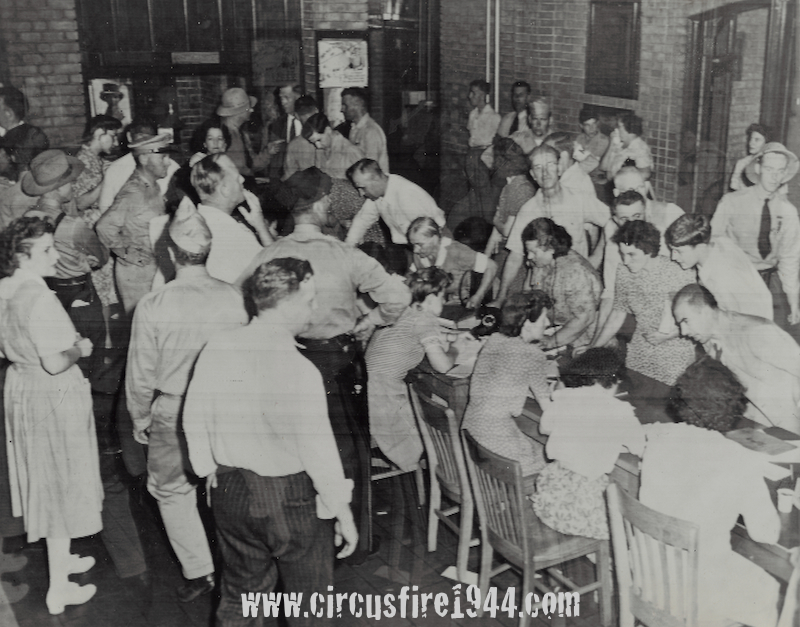 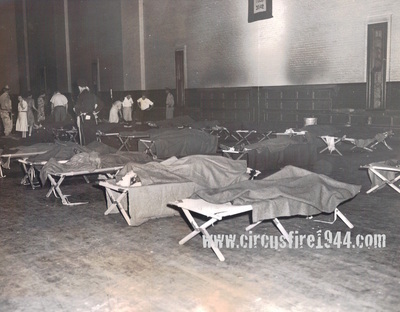 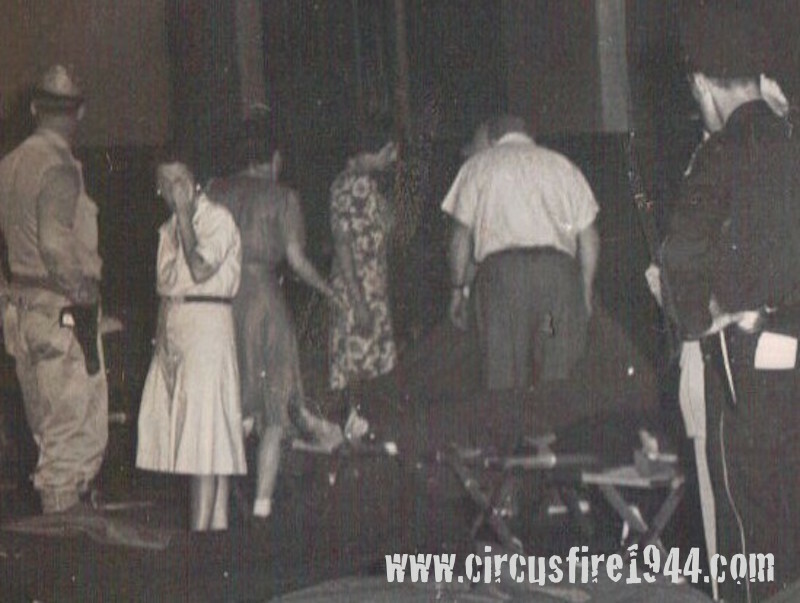 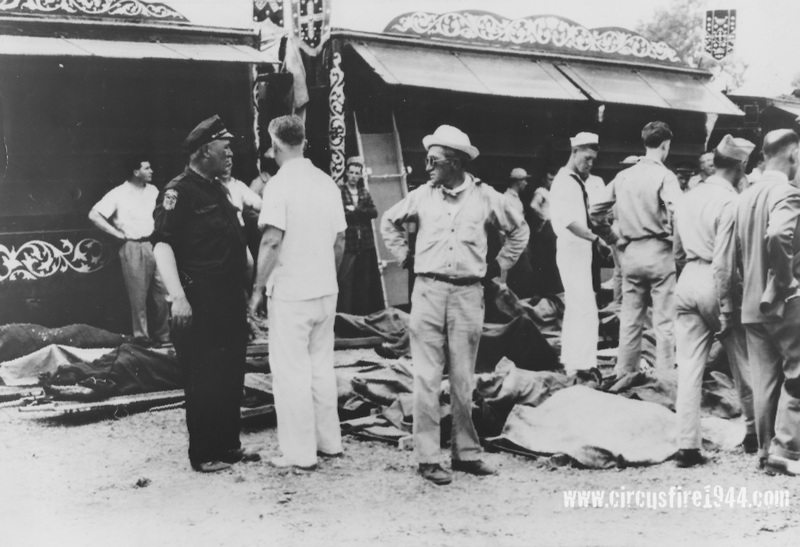 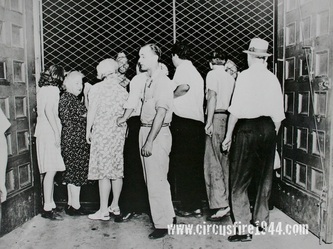 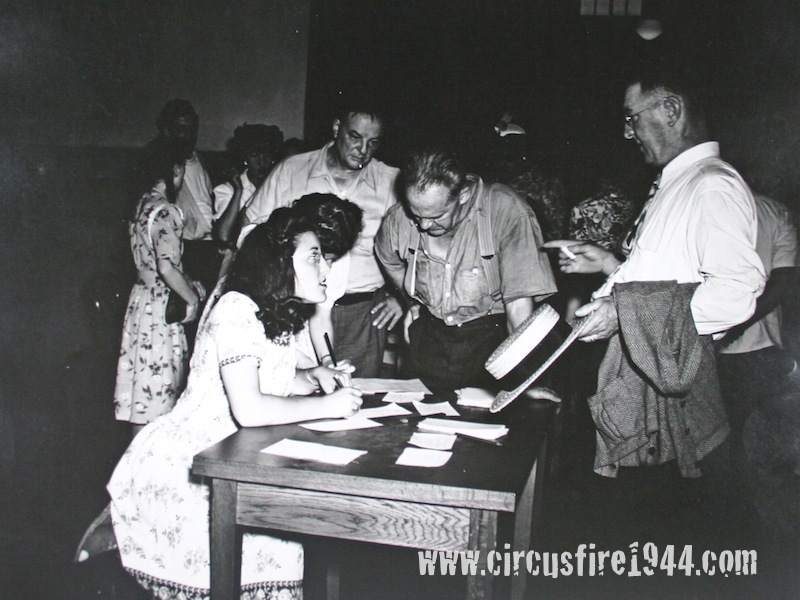 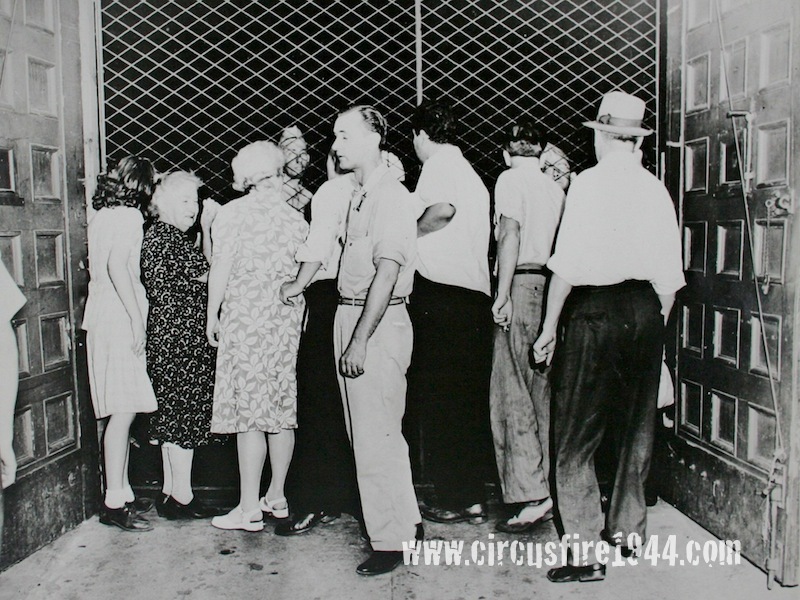 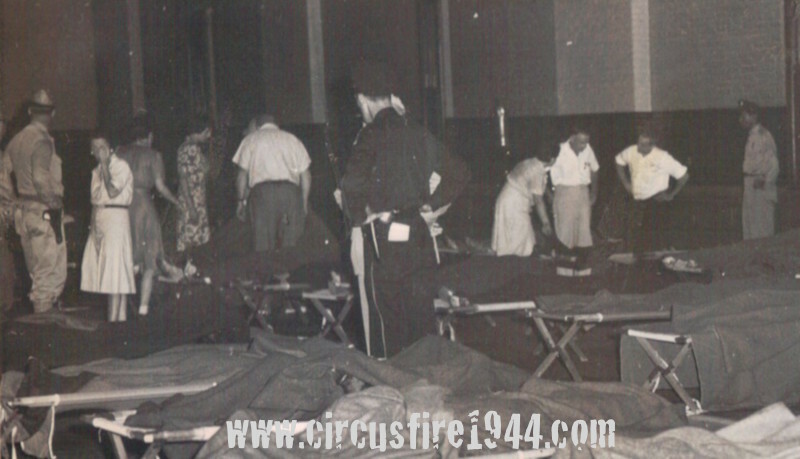 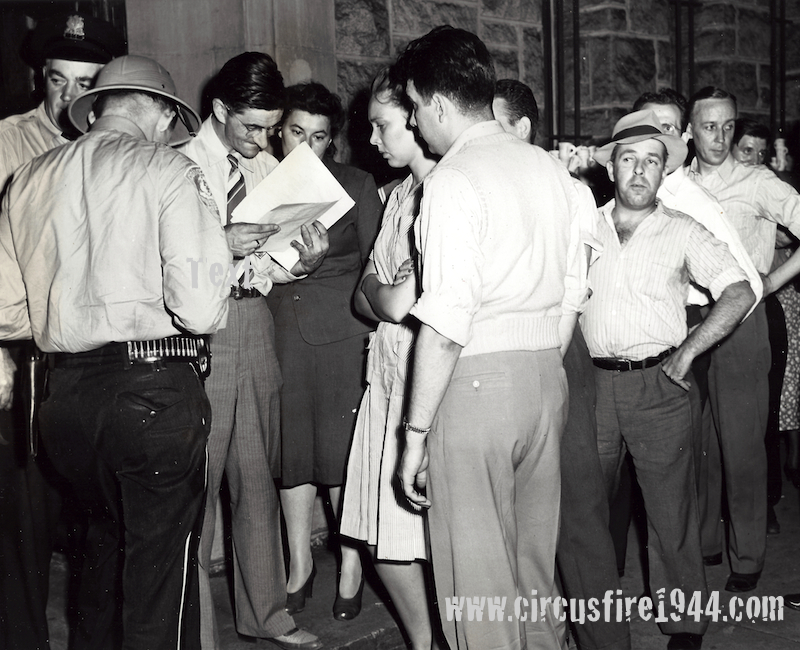 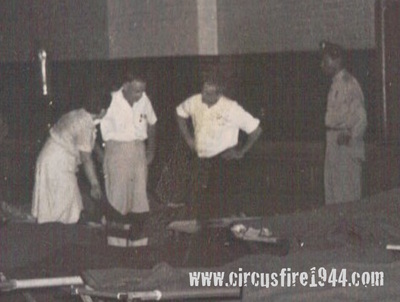 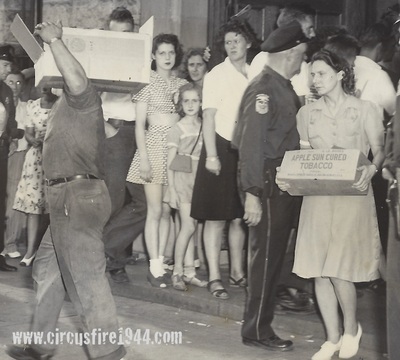 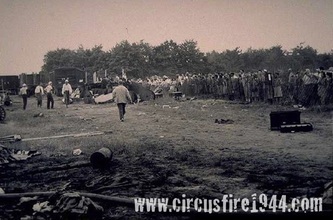 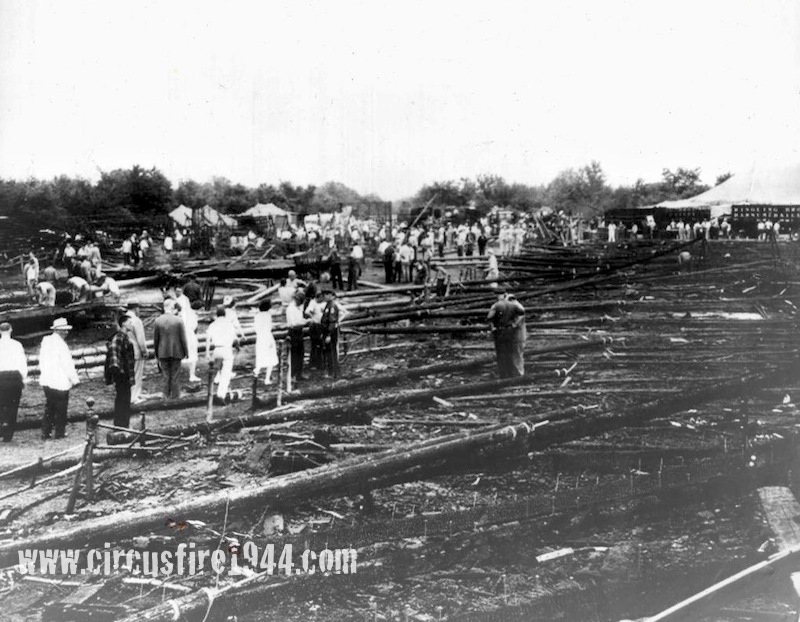 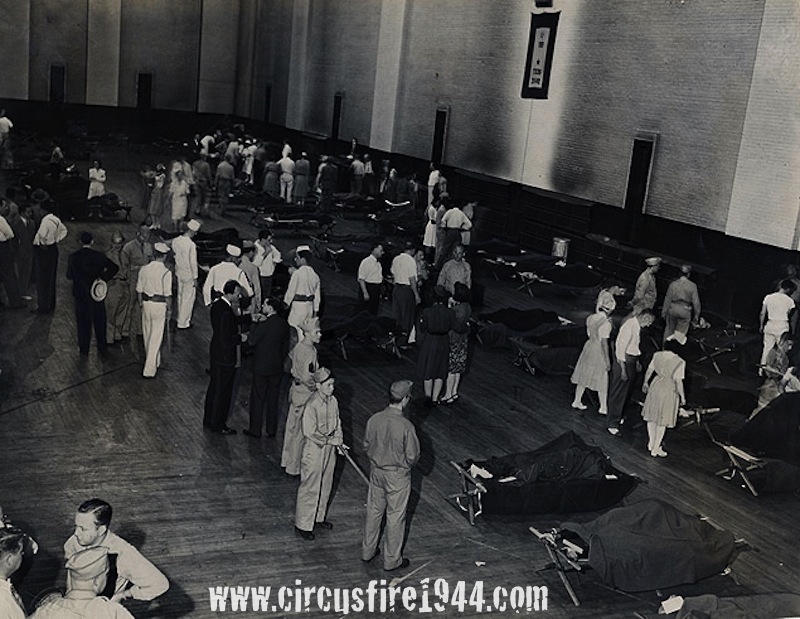 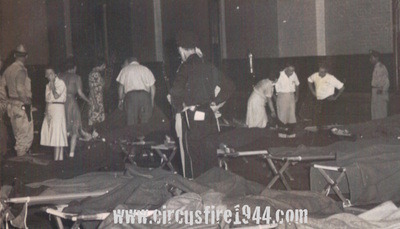 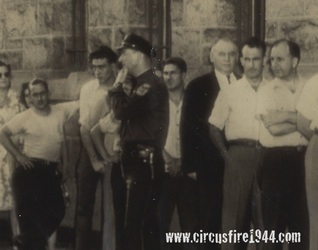 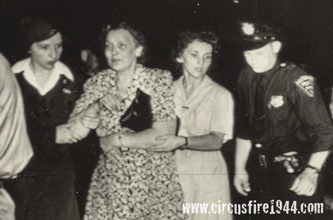 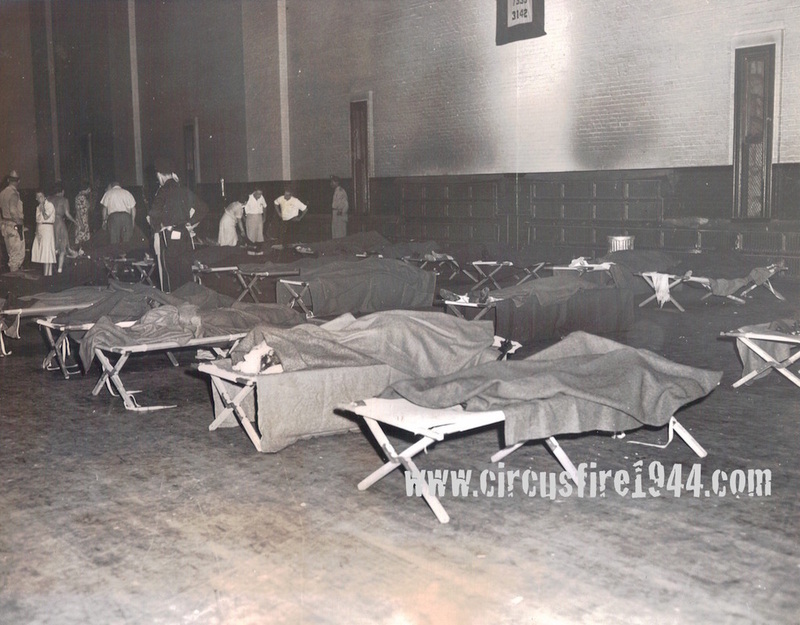 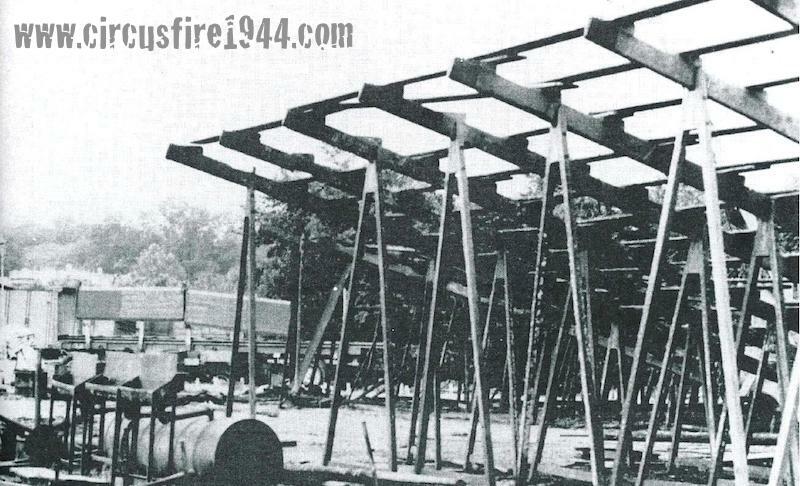 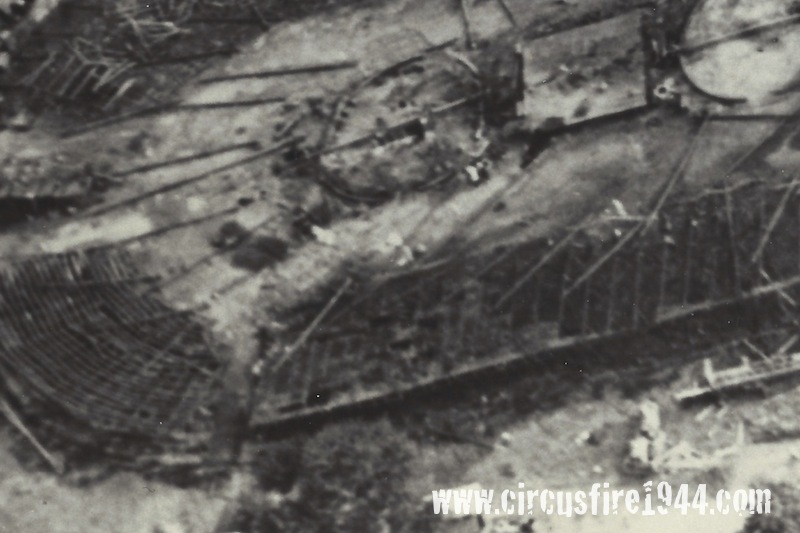 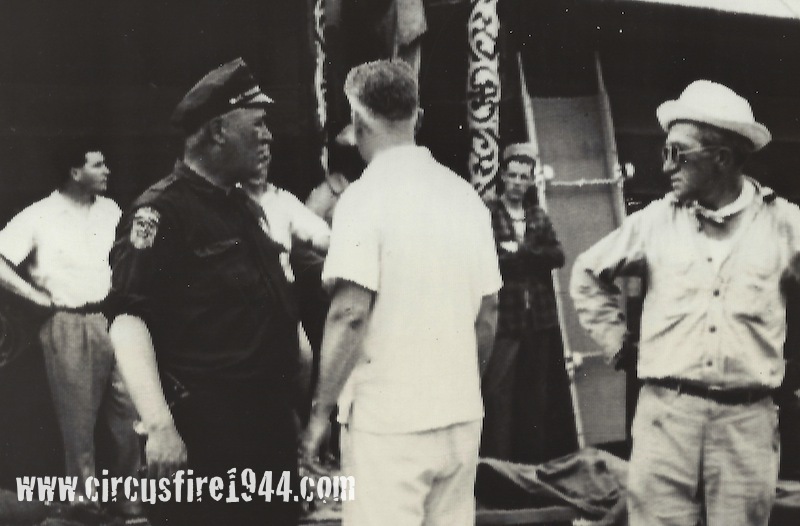 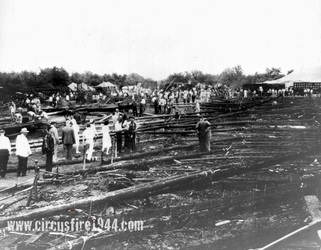 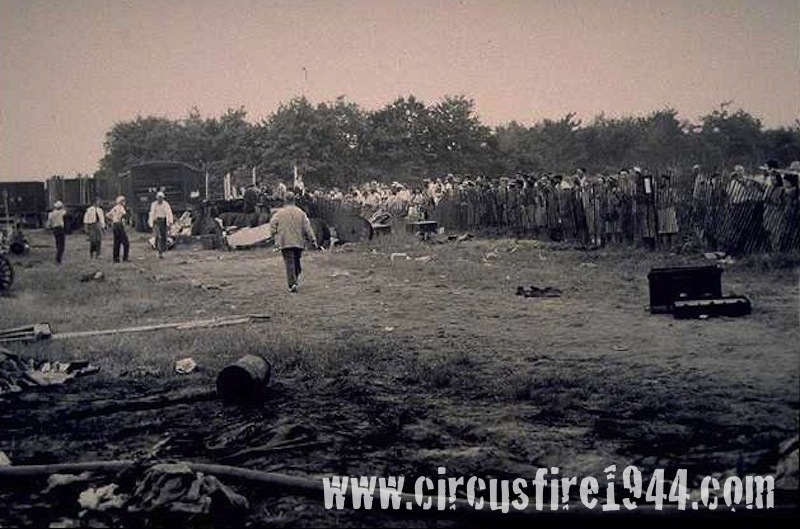 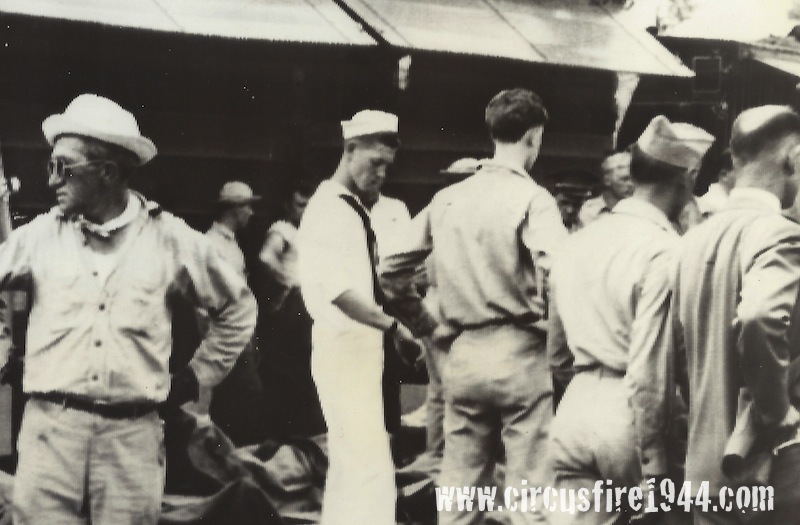 Circus fire victims laid out in the Connecticut State Armory waiting for identification. 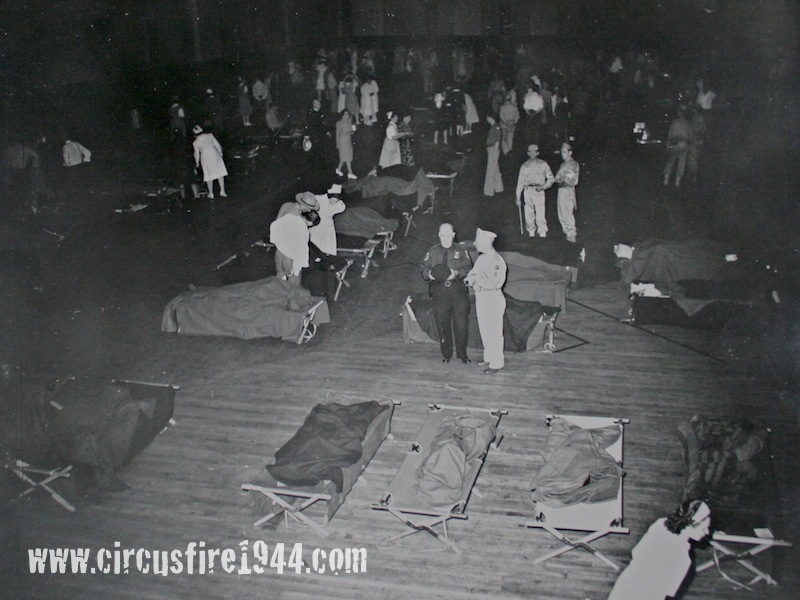 Women who have identified circus fire victims at the State Armory. 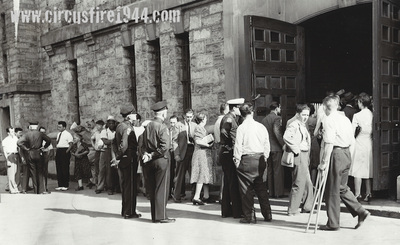 Inside the armory, people viewing the deceased. 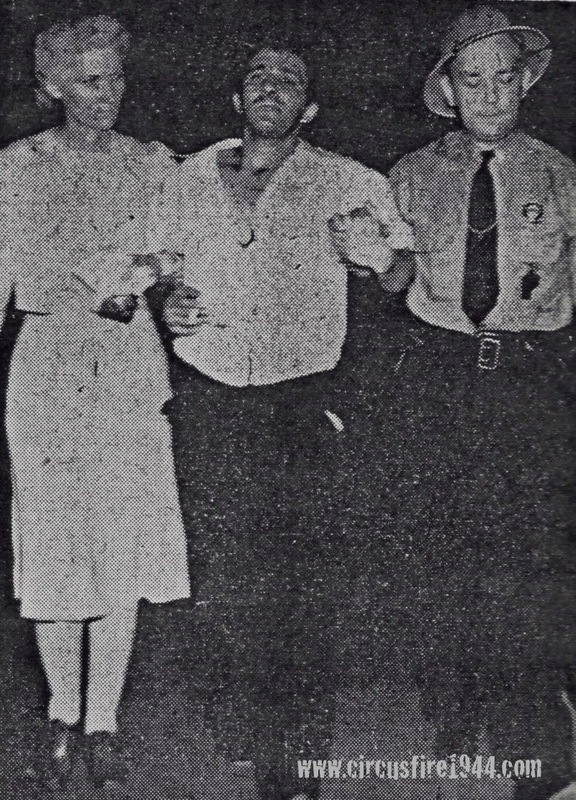 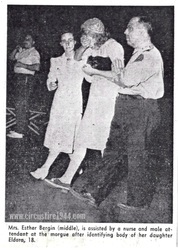 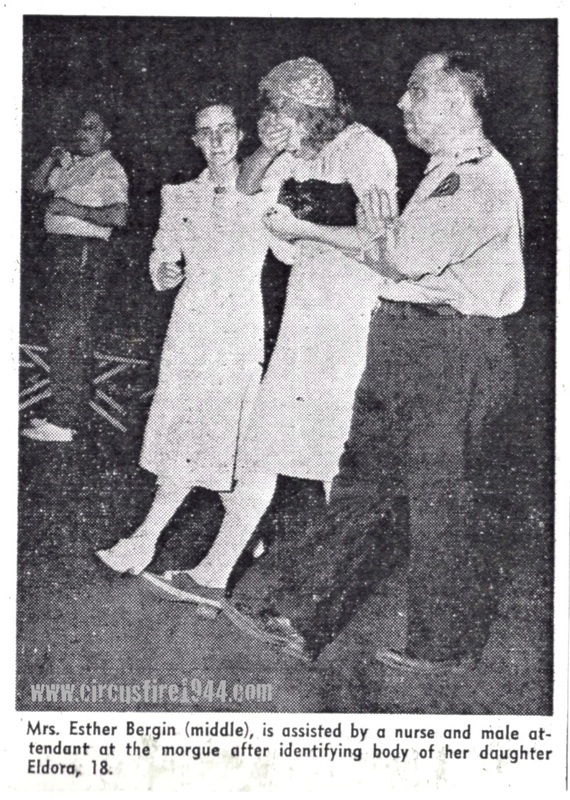 Unidentified woman searching for someone in the morgue is escorted by a Red Cross worker and a nurse. 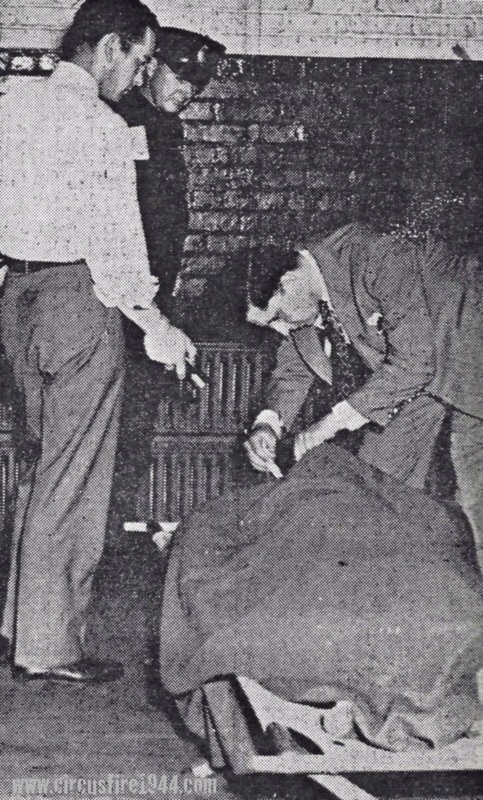 Feet and toes of a victim can be seen in the lower right corner. 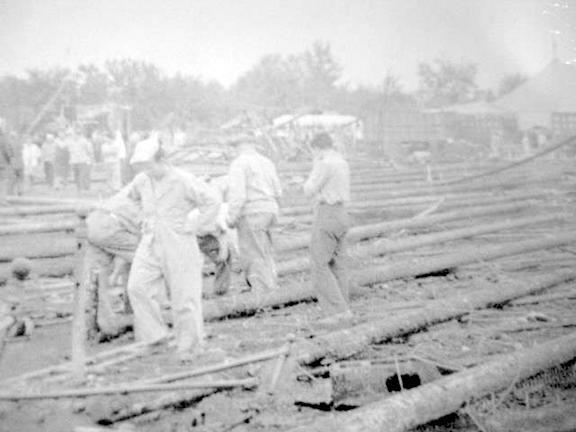 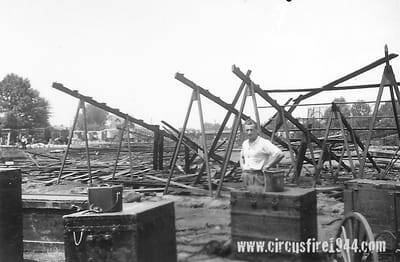 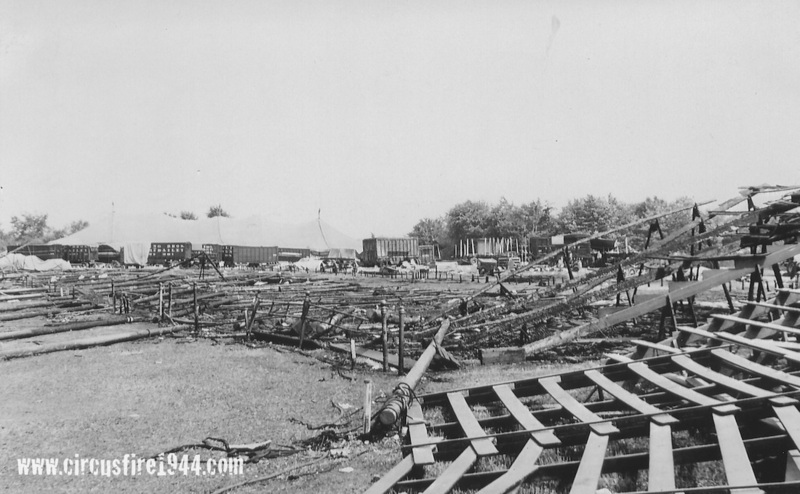 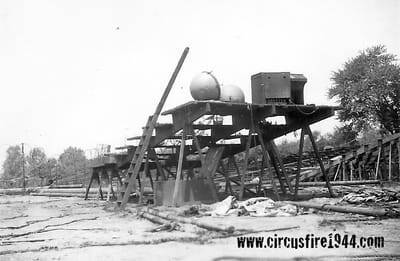 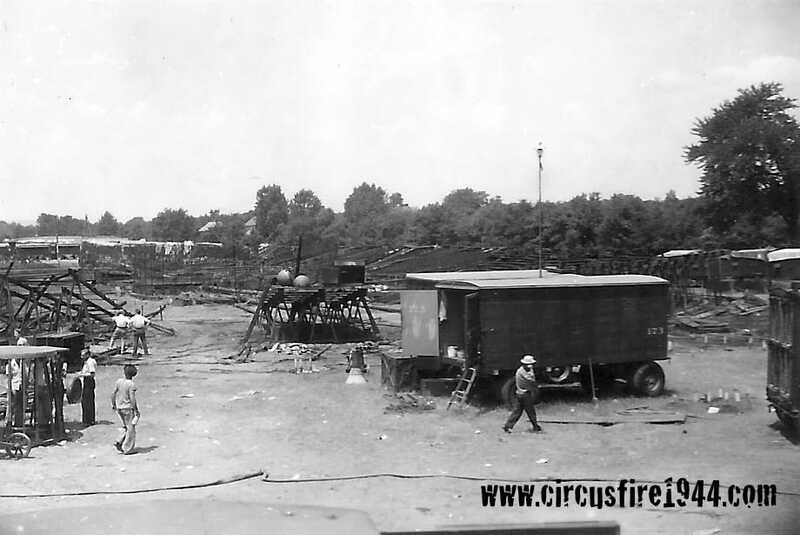 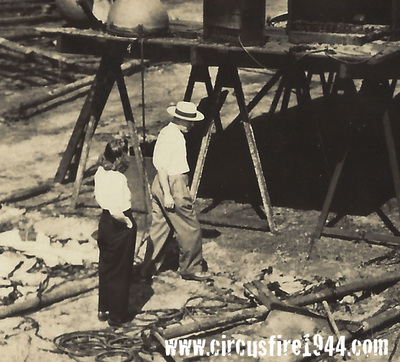 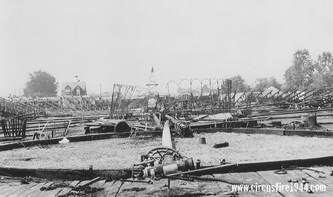 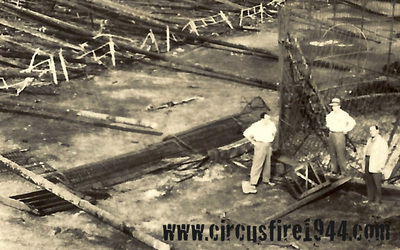 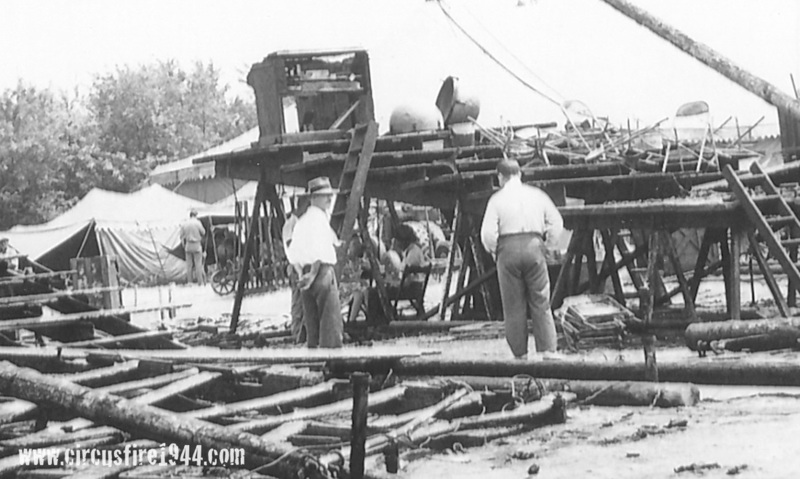 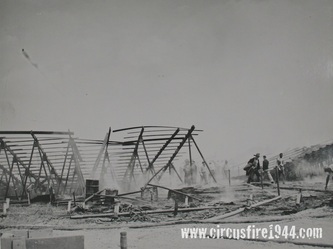 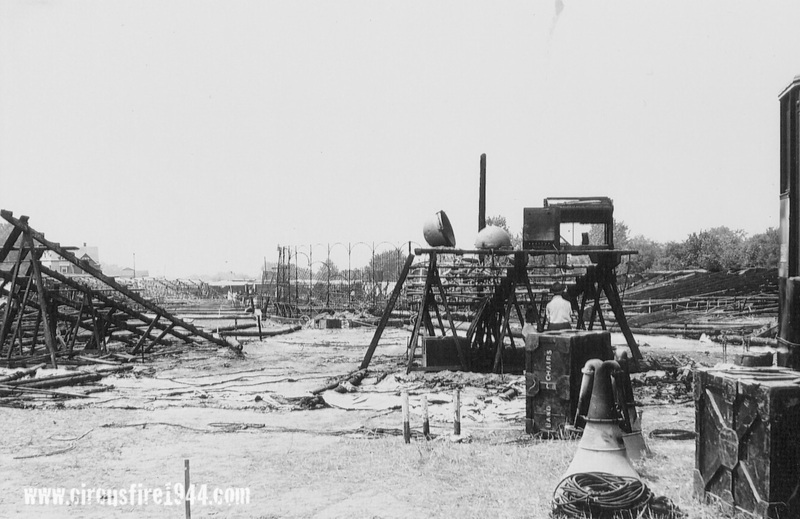 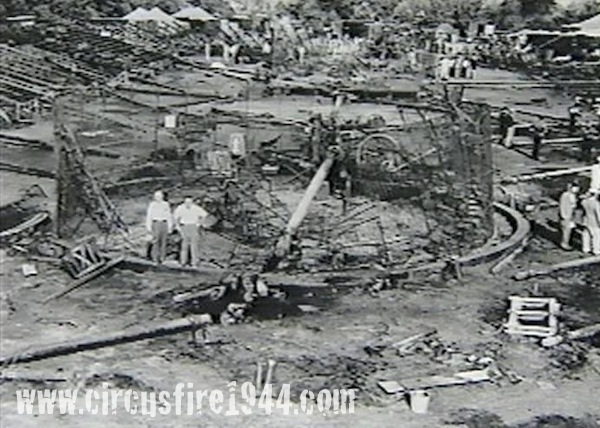 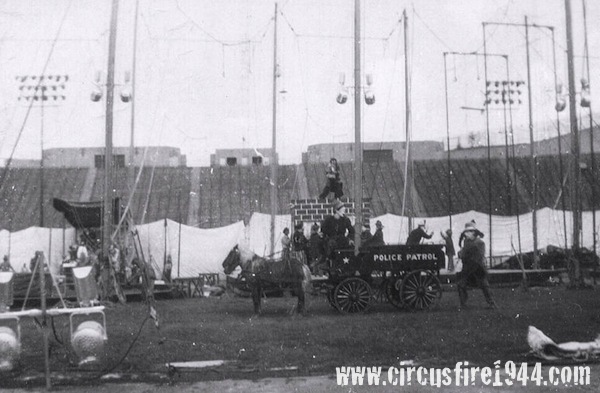 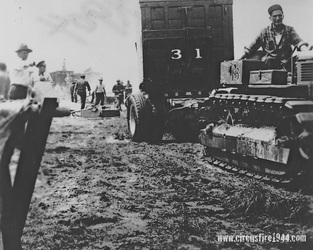 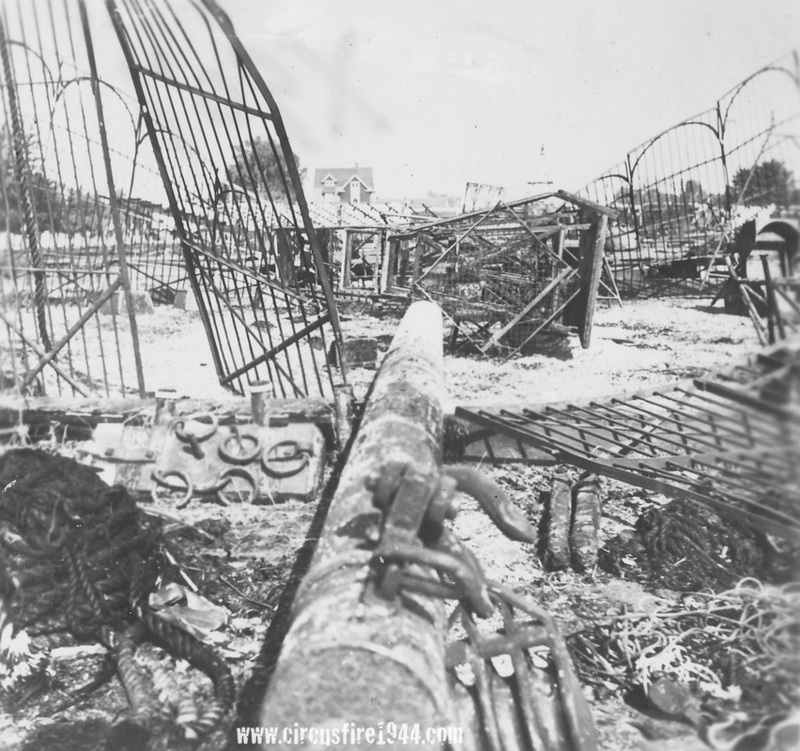 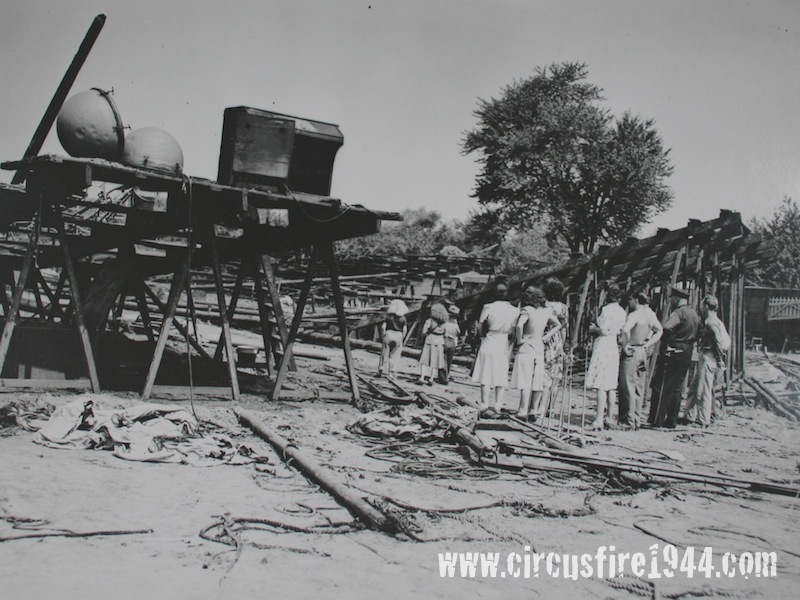 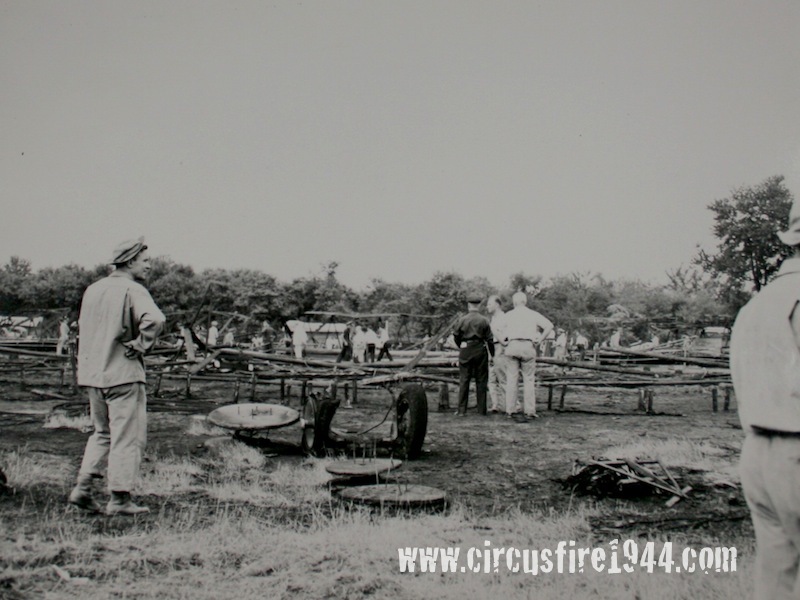 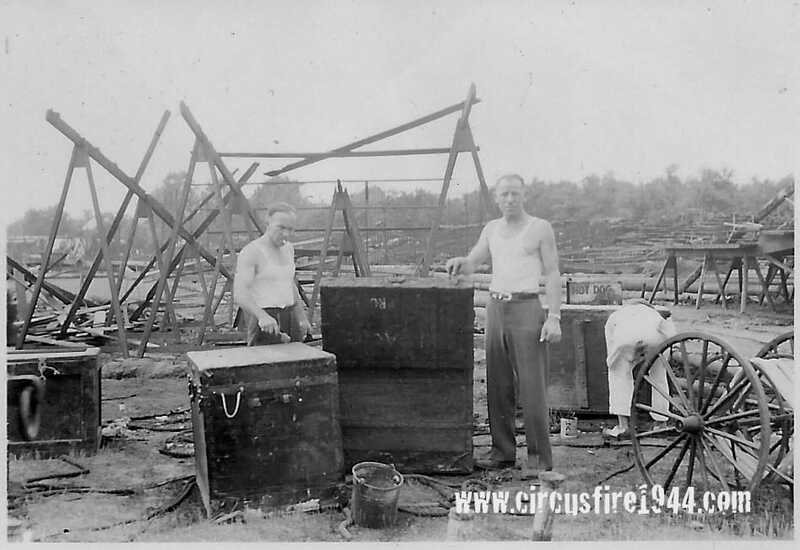 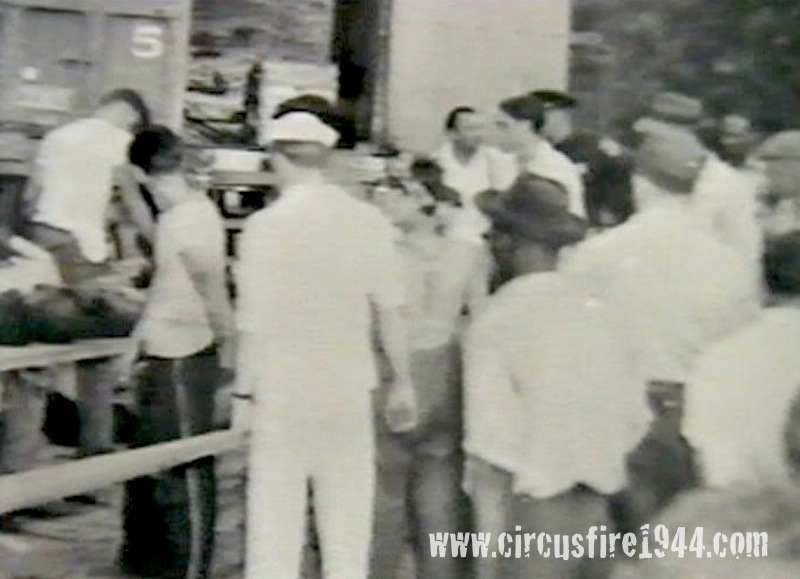 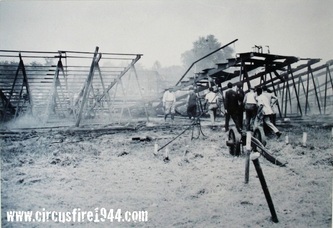 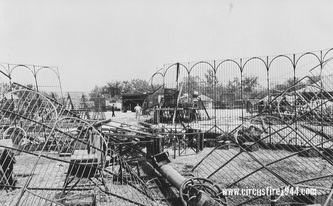 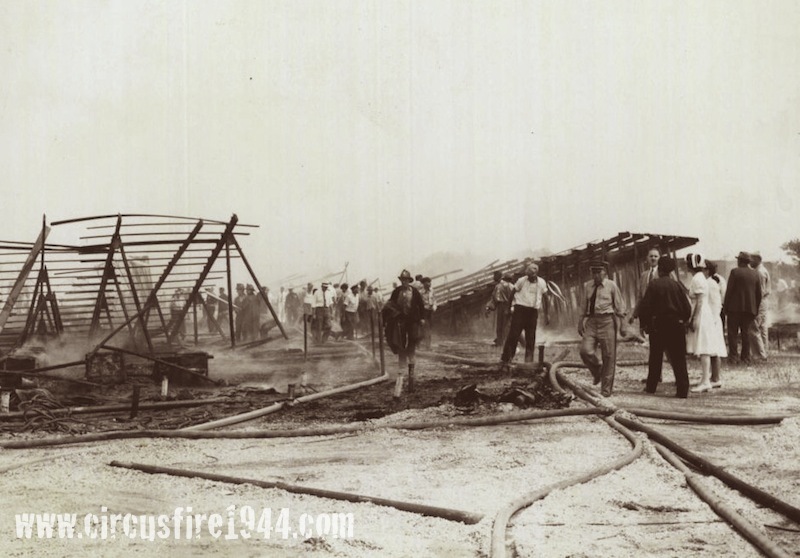 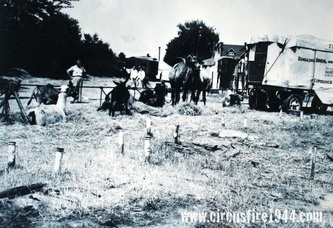 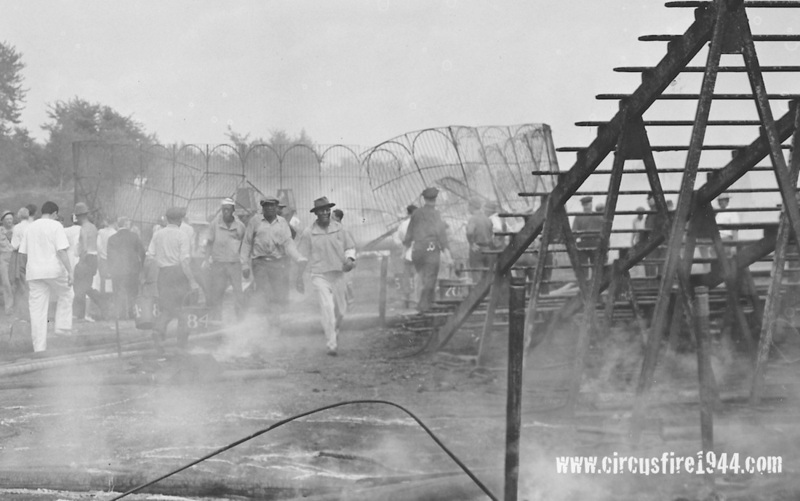 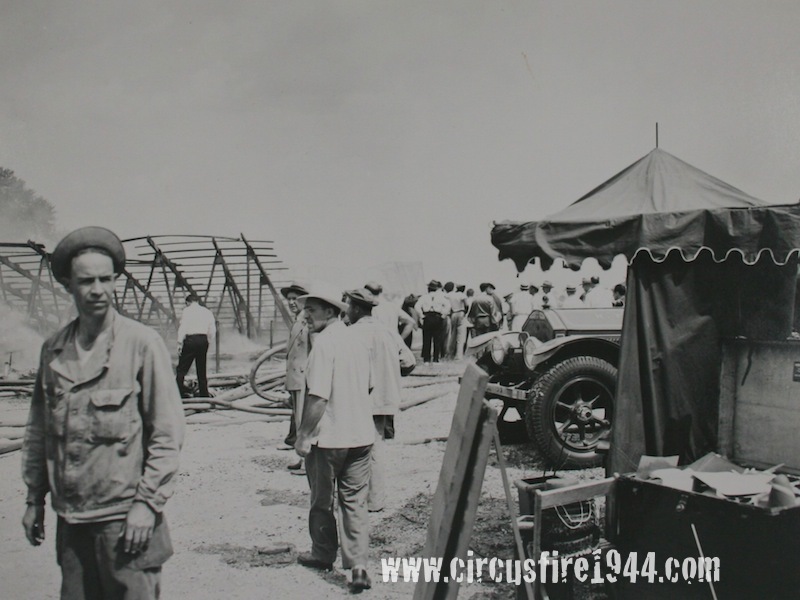 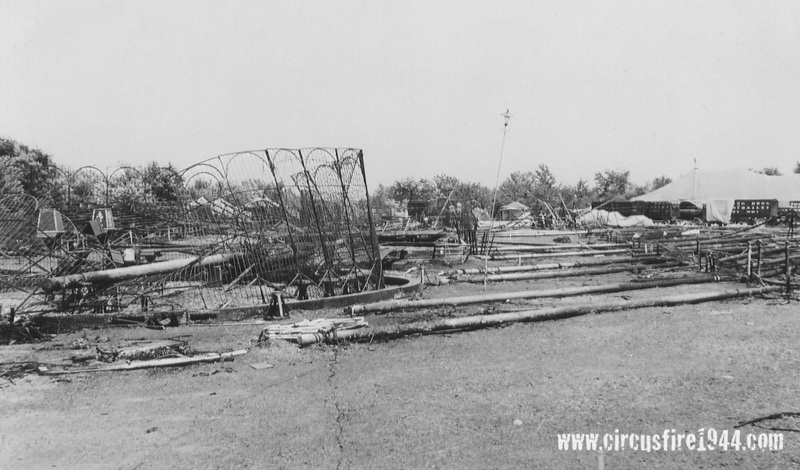 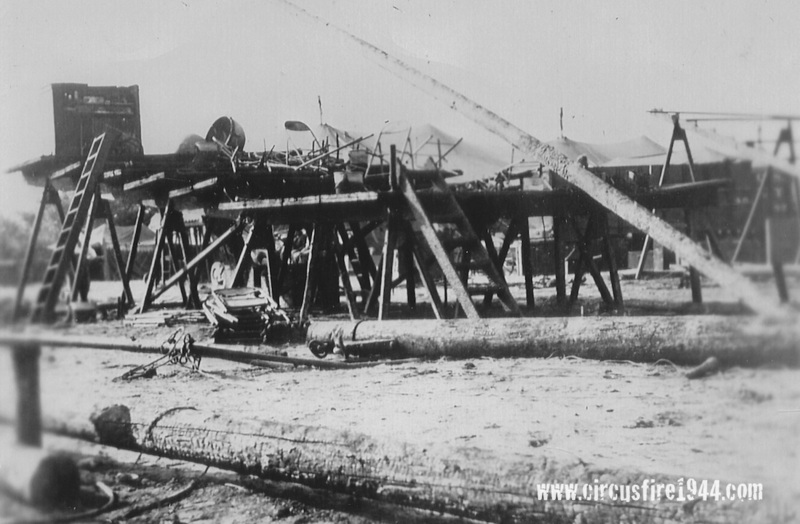 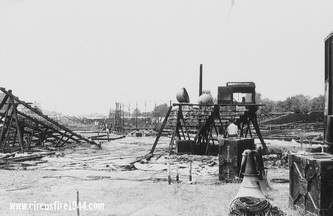 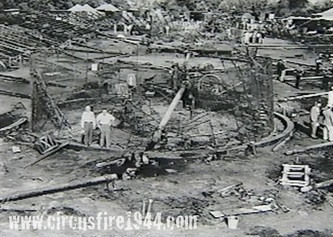 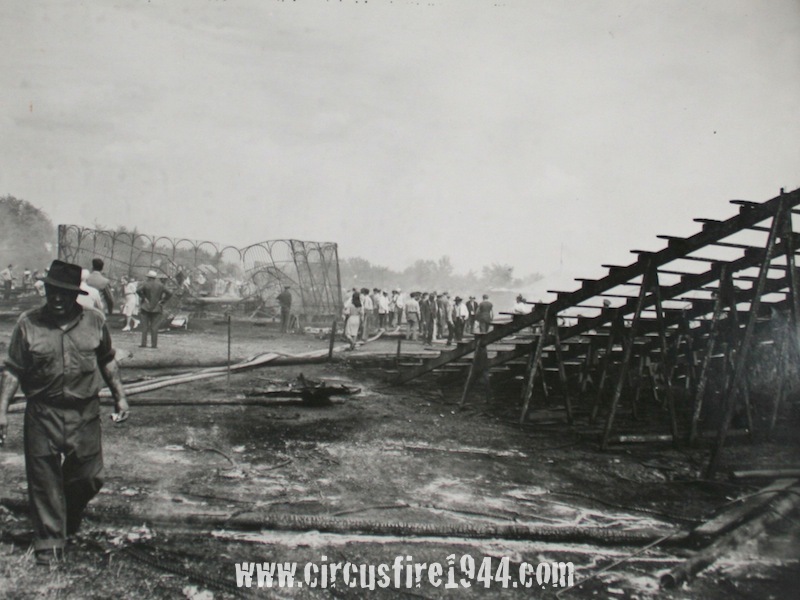 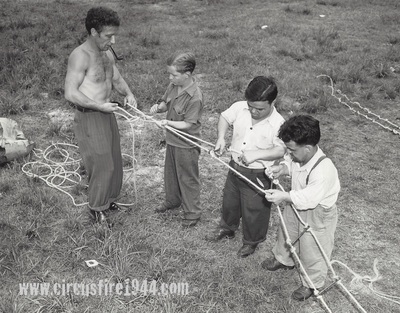 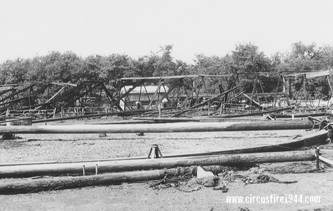 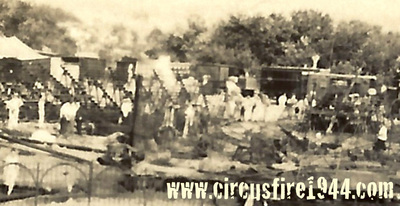 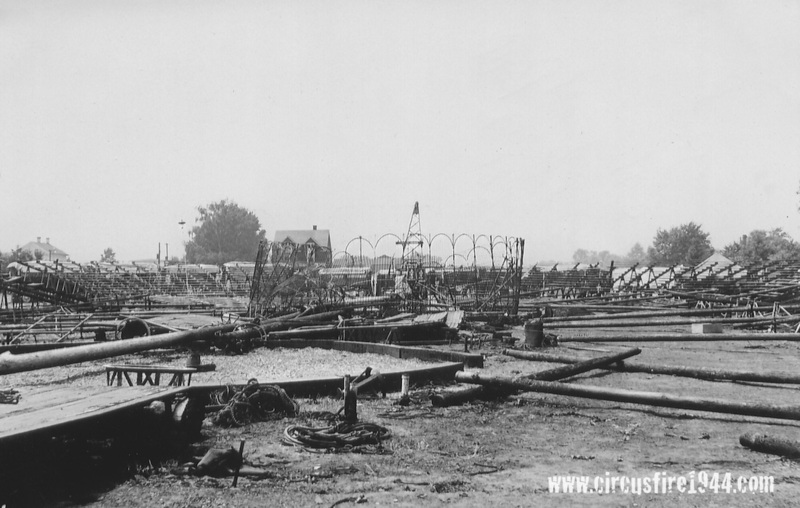 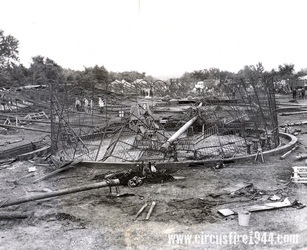 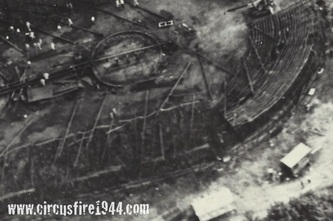 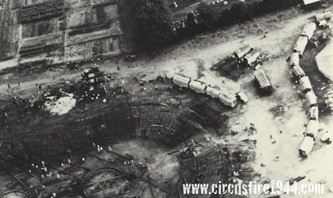 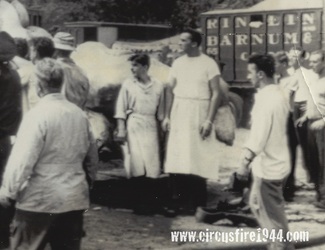 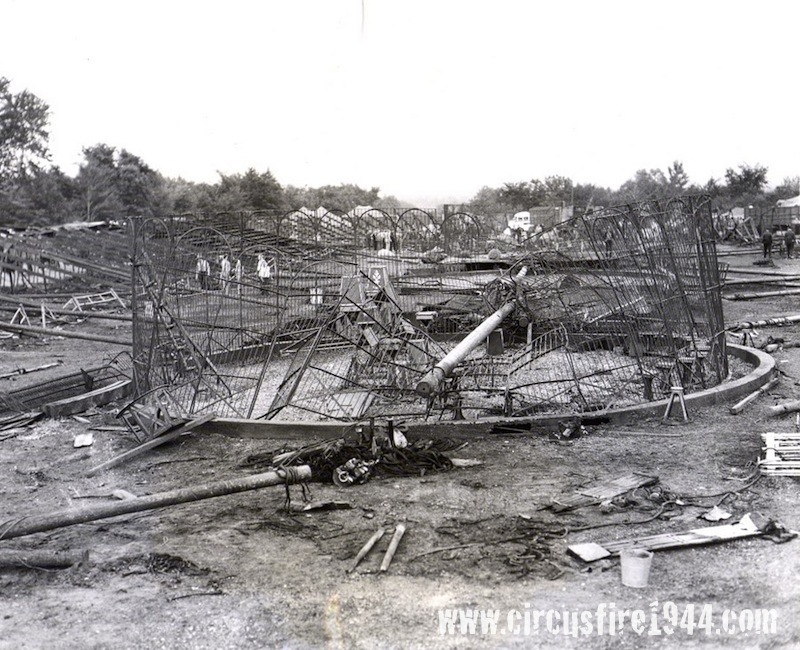 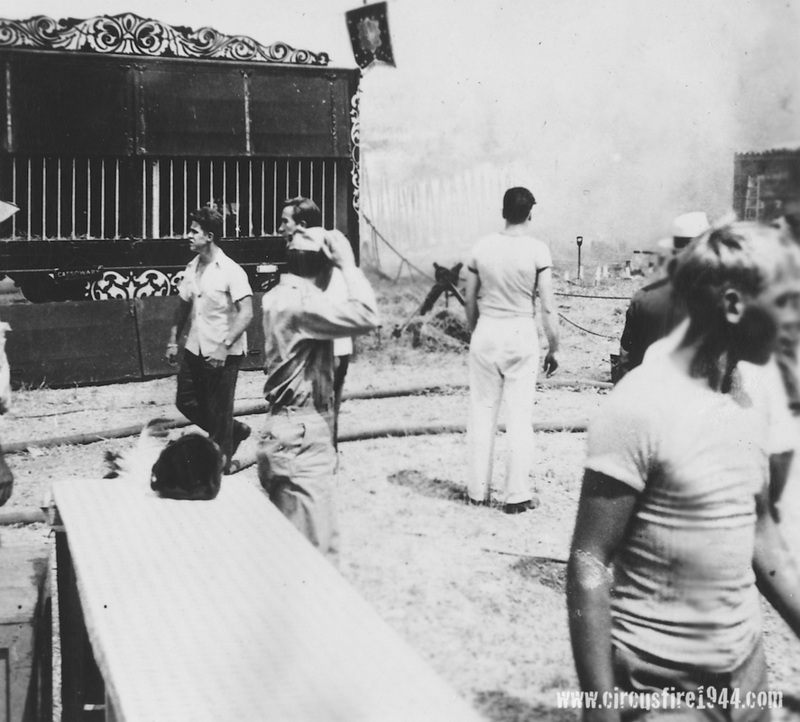 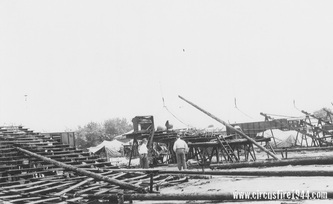 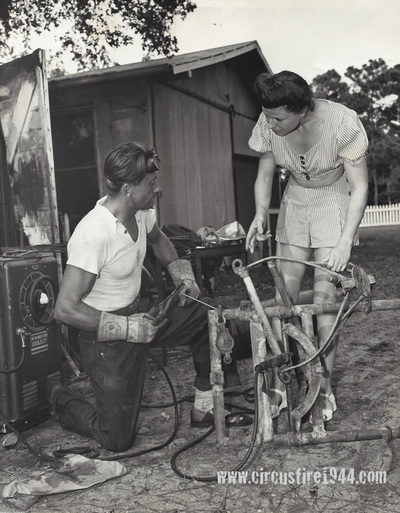 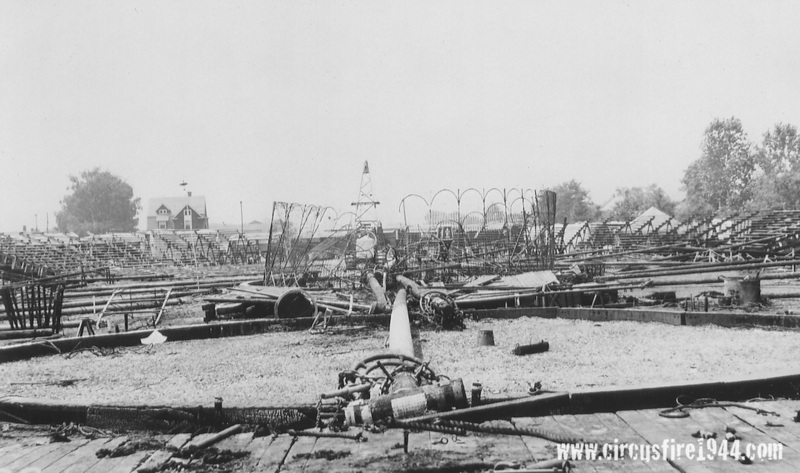 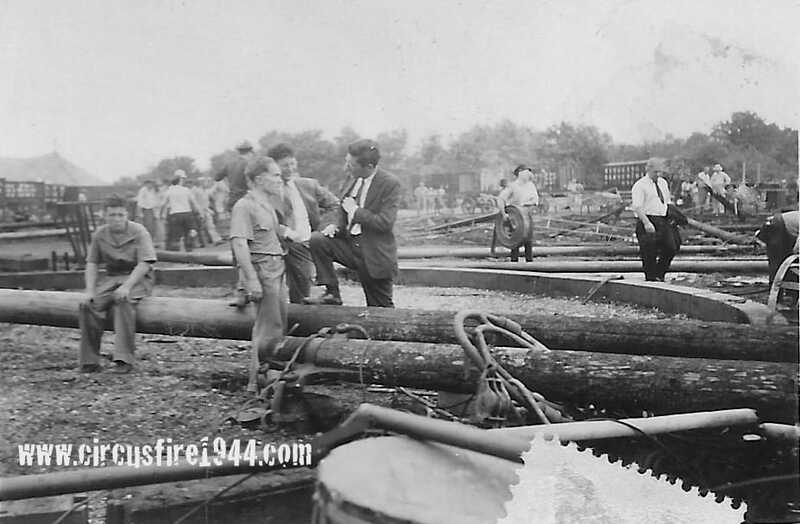 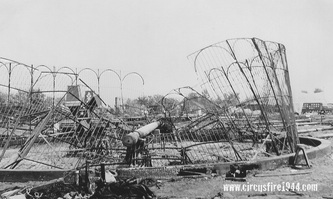 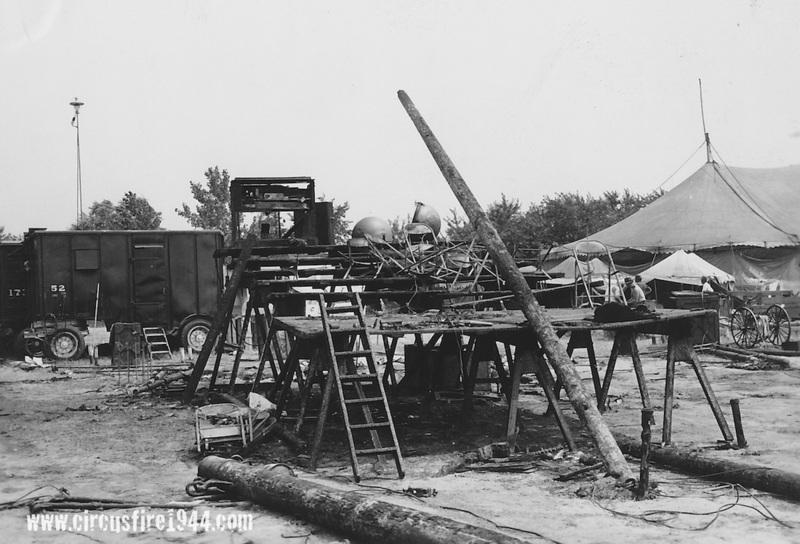 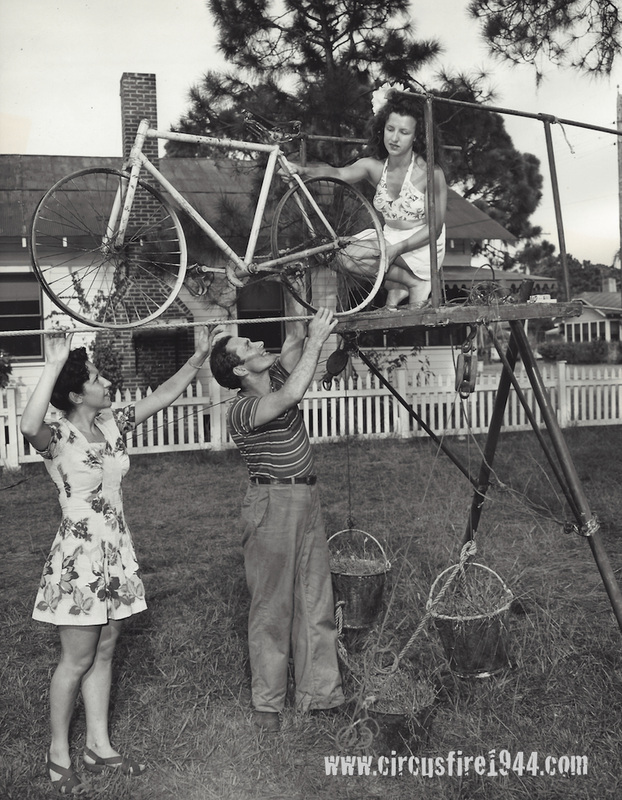 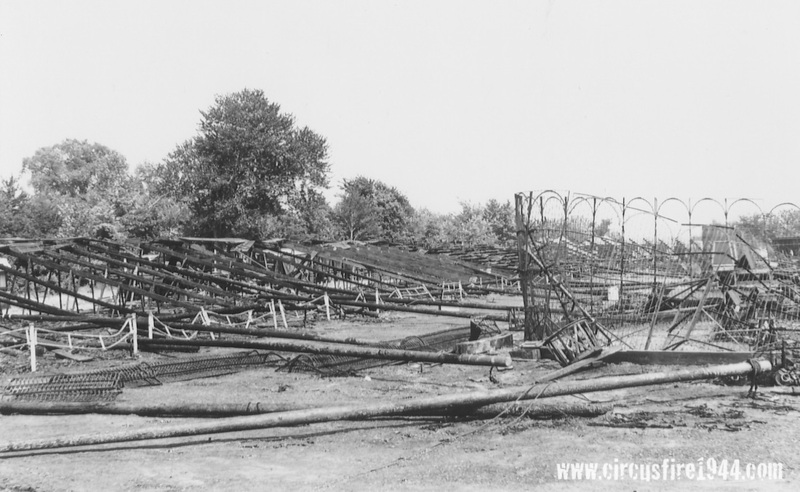 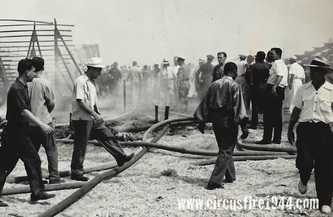 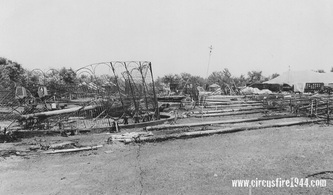 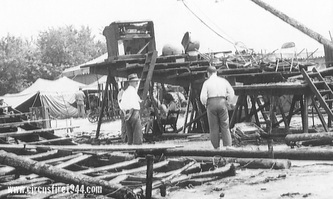 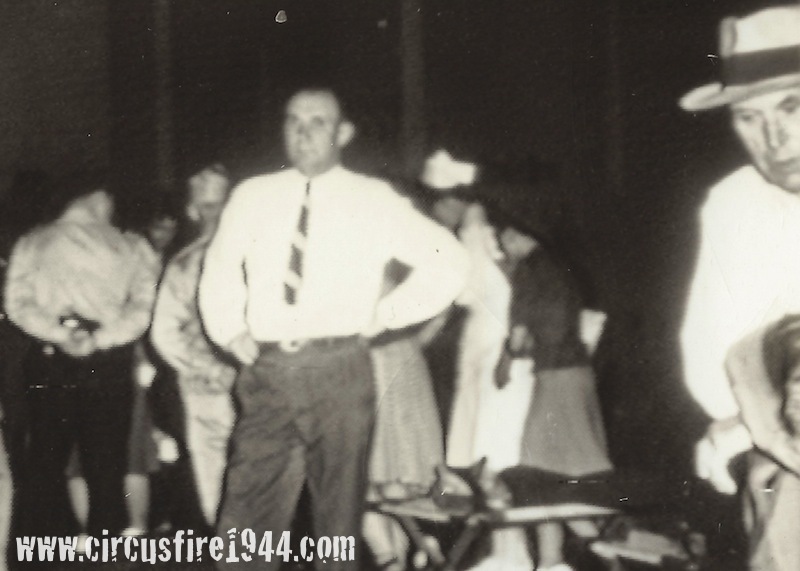 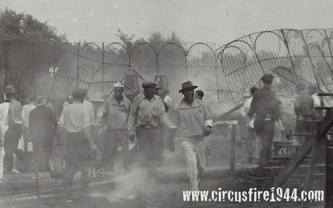 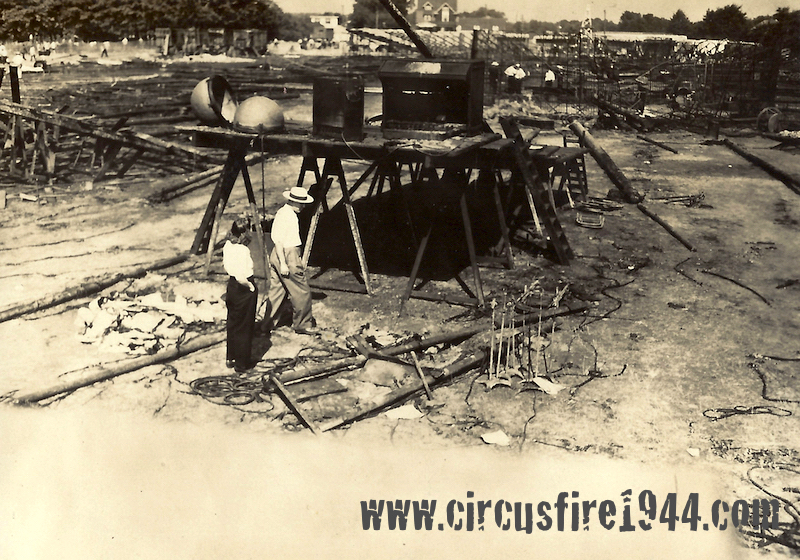 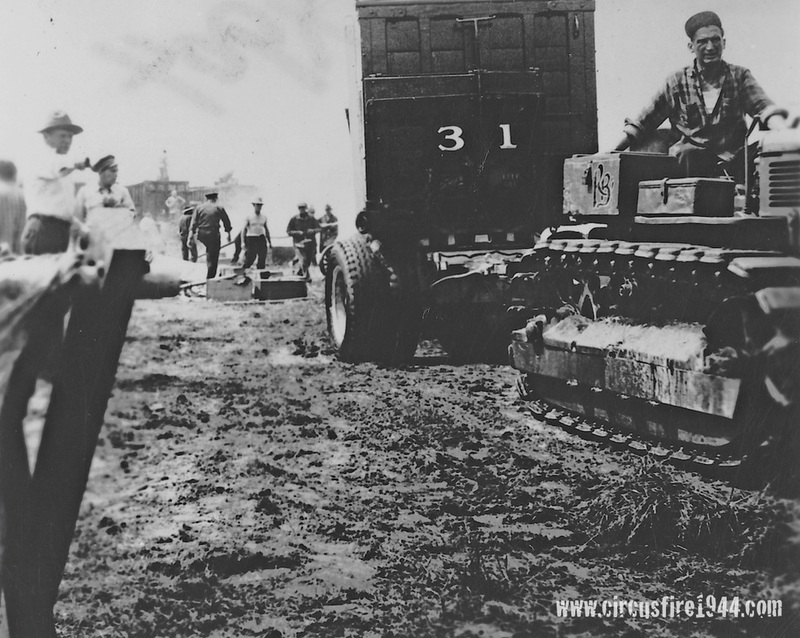 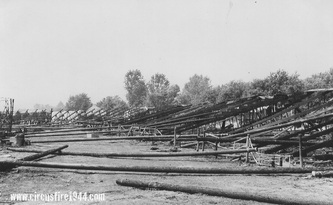 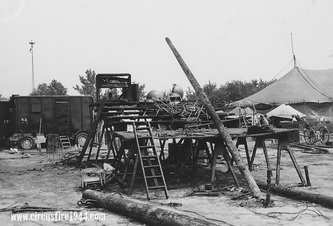 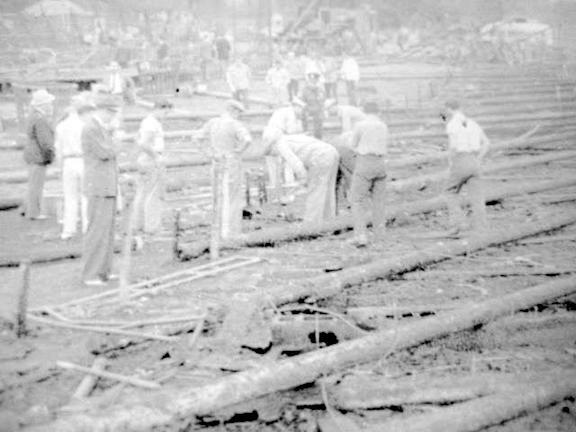 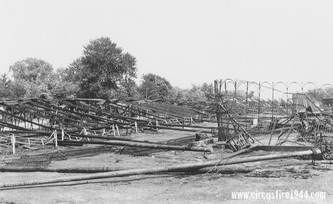 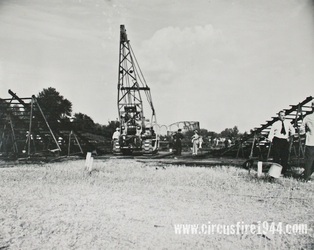 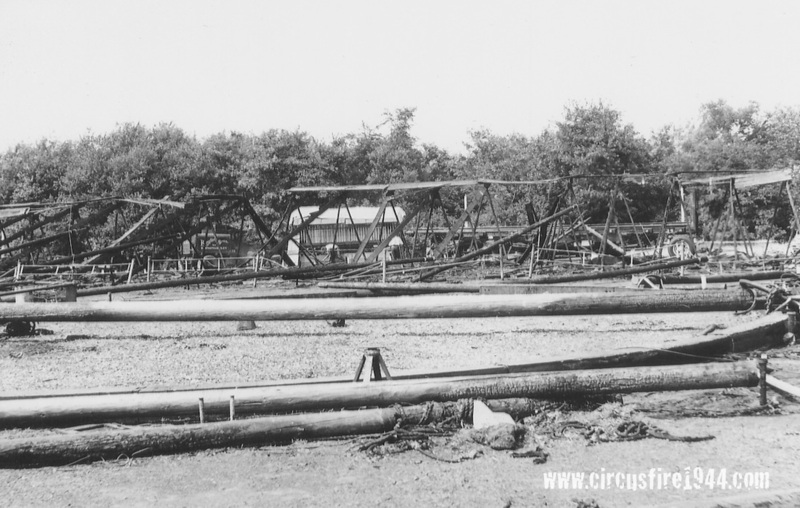 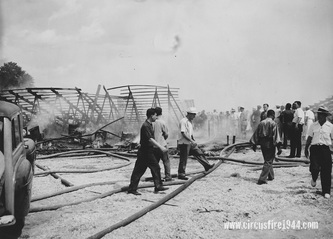 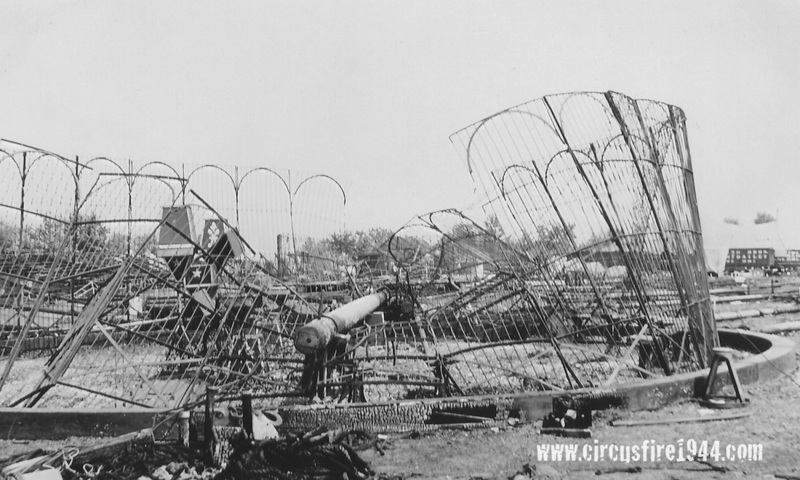 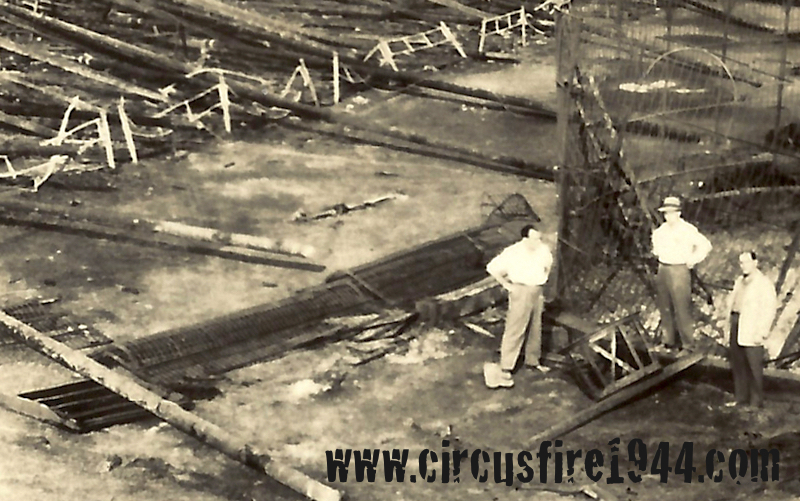 Circus workers and performers begin rebuilding equipment upon their return to RBBB winter headquarters in Sarasota, Florida, two weeks after the circus fire. 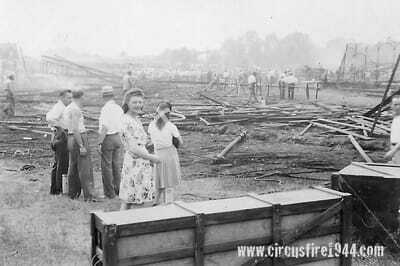 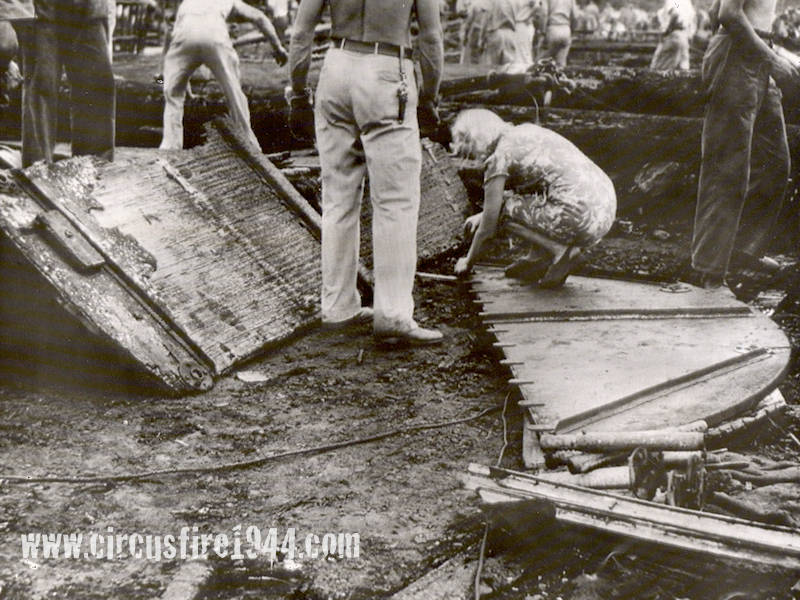 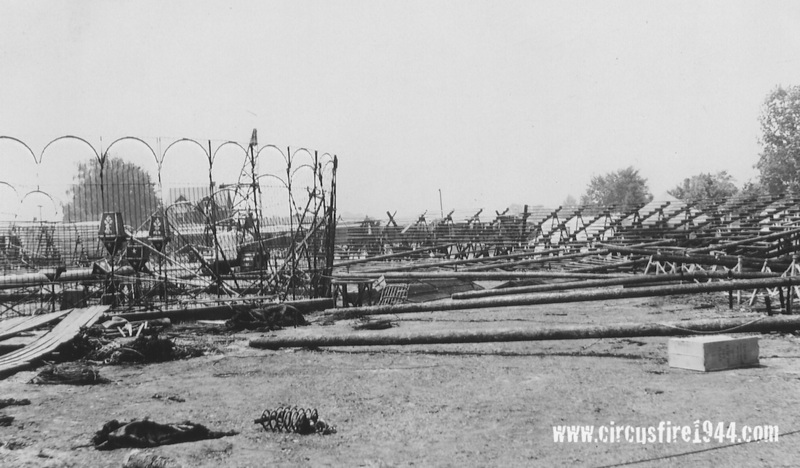 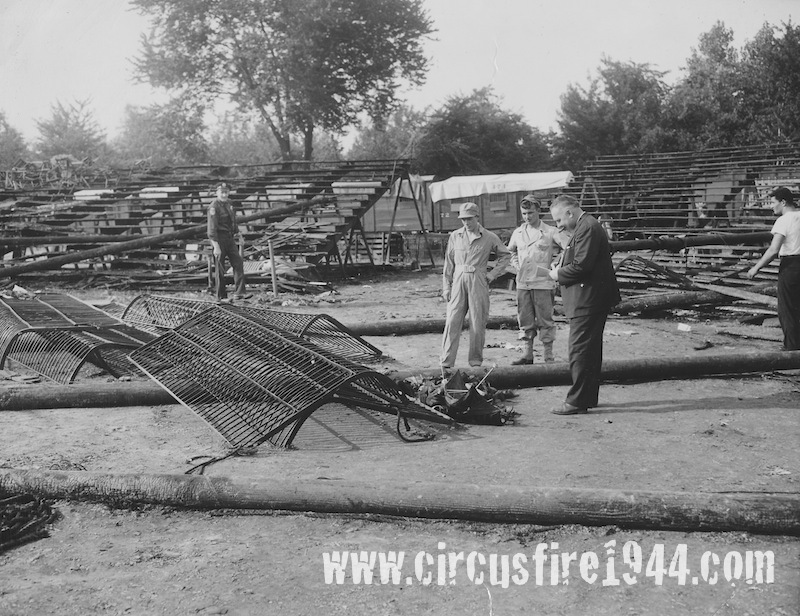 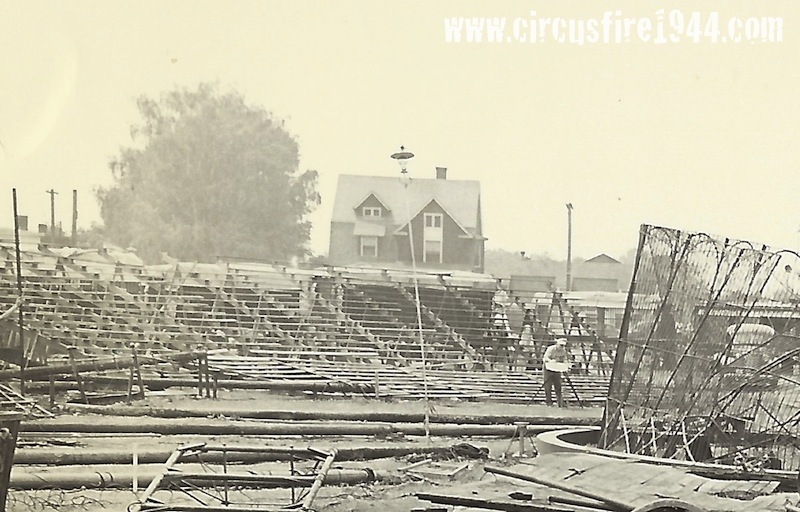 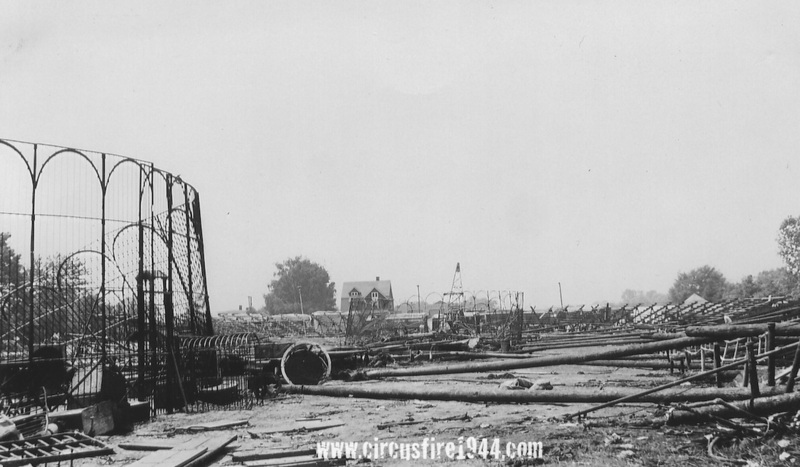 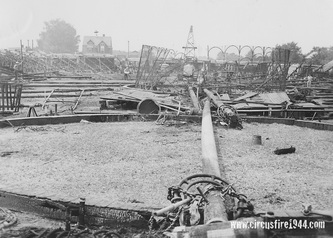 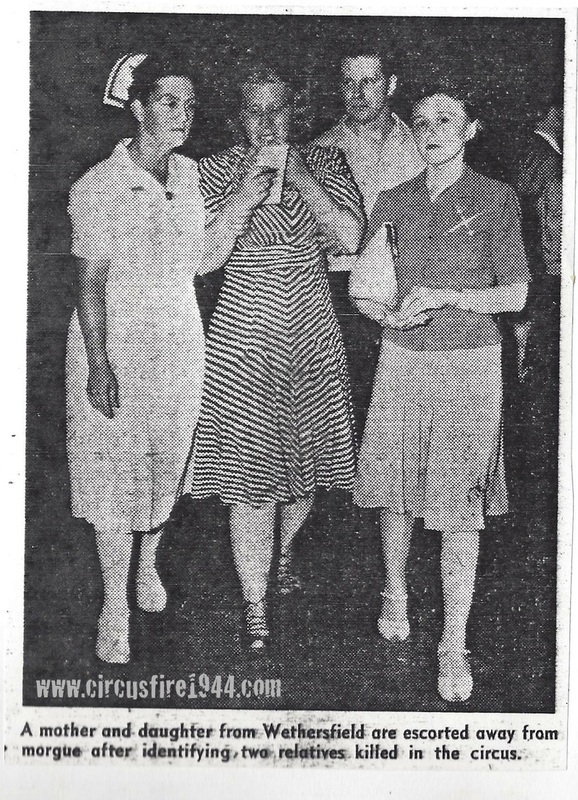 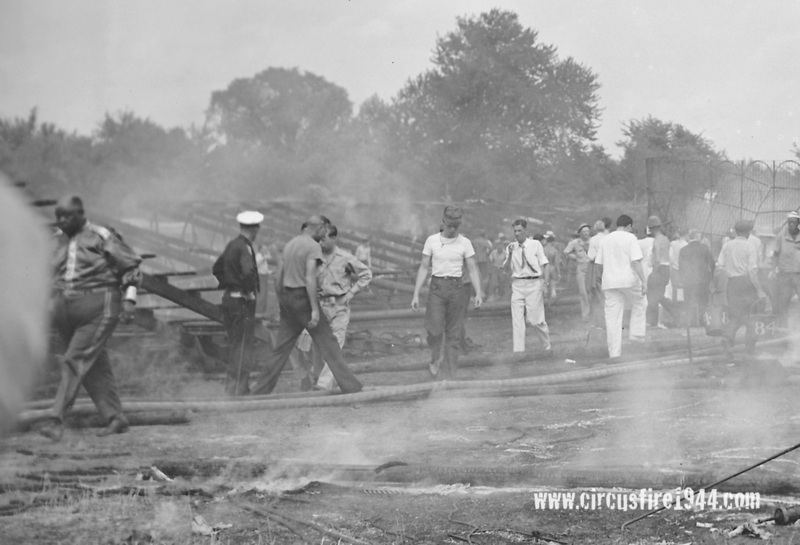 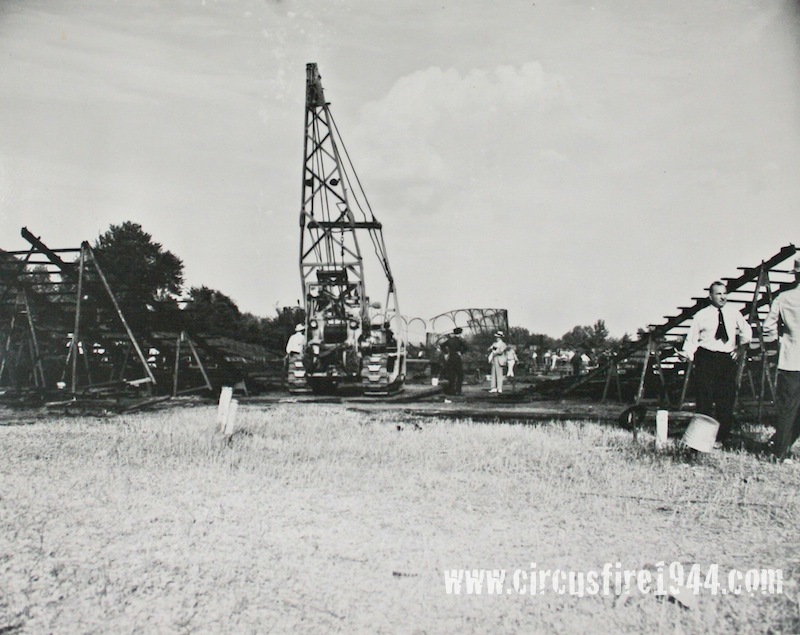 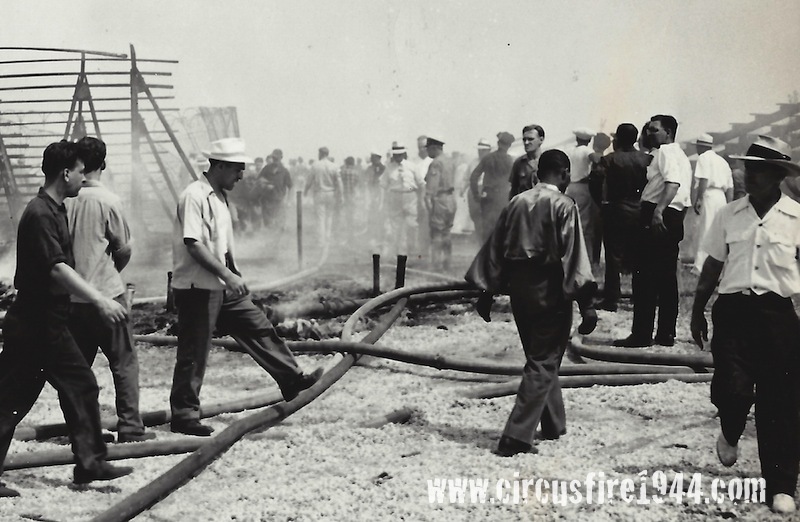 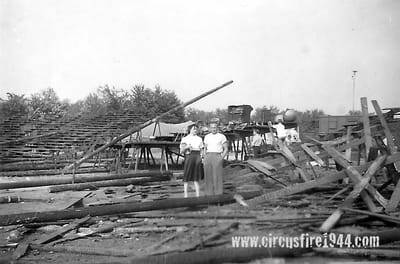 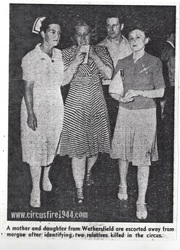 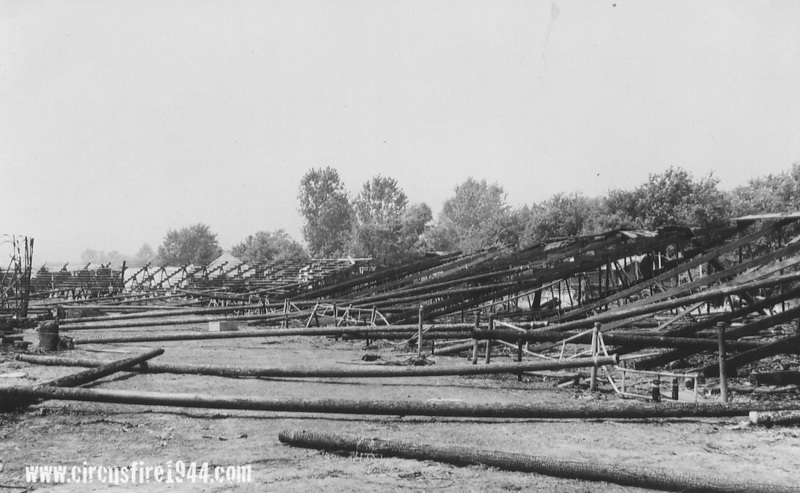 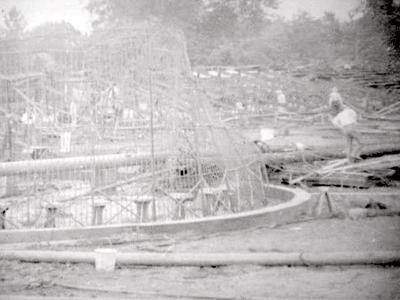 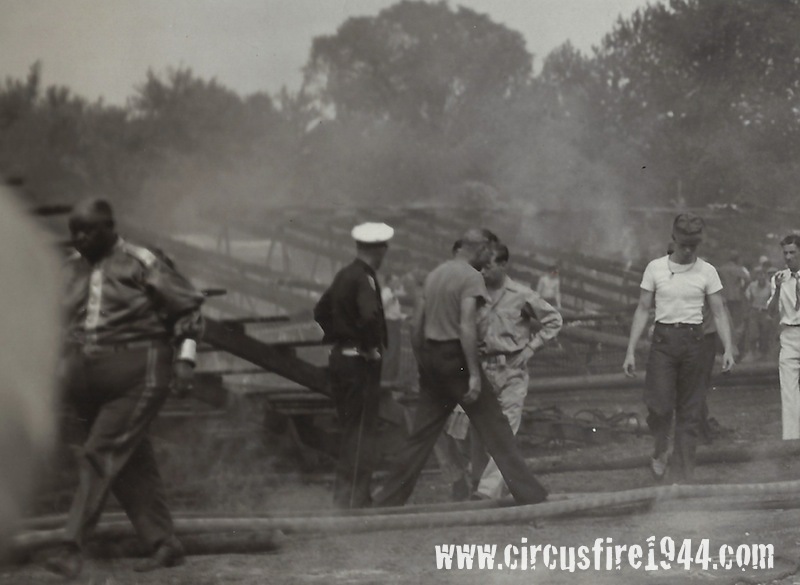 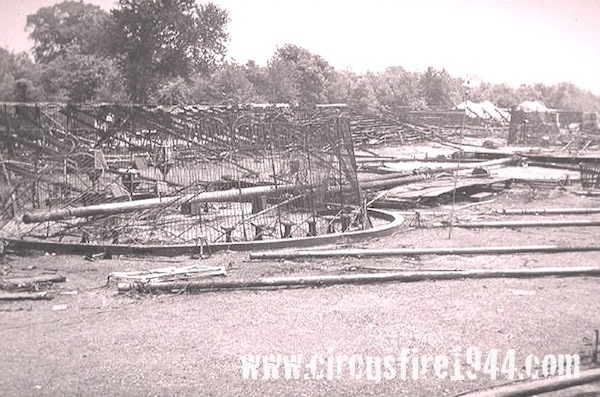 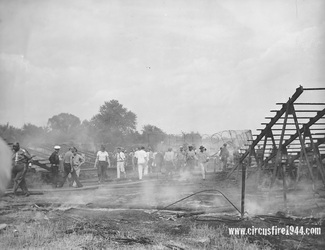 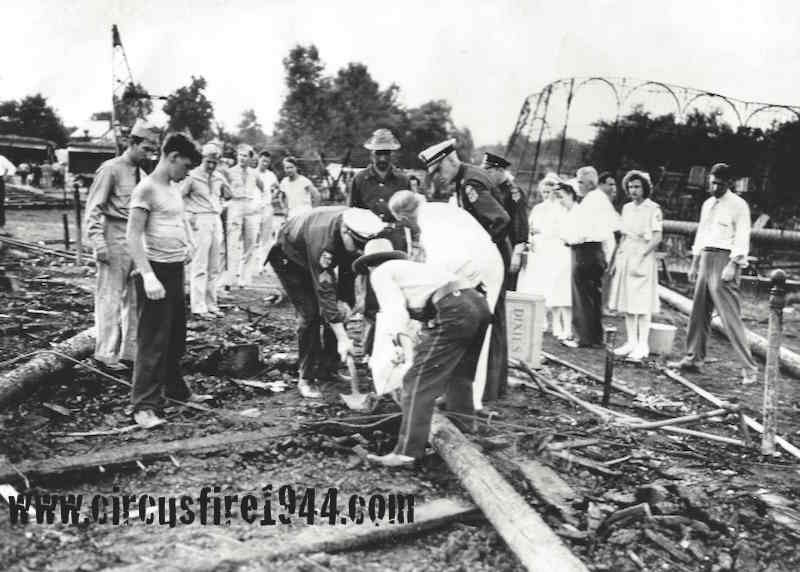 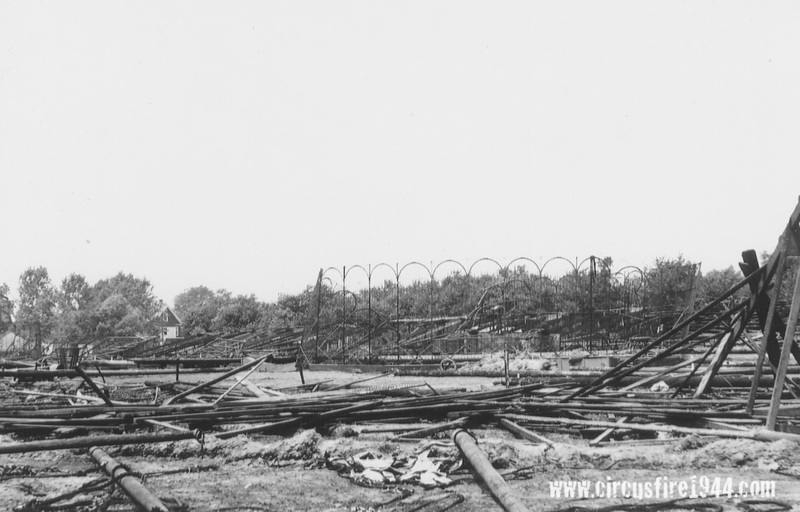 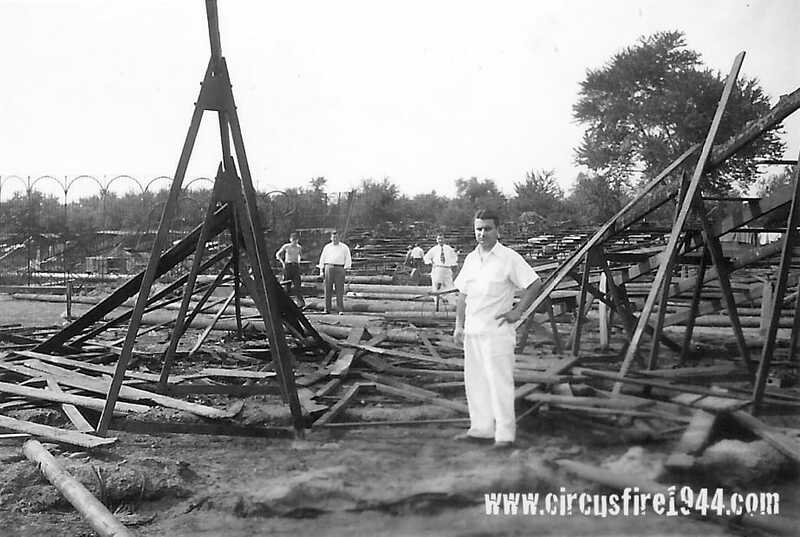 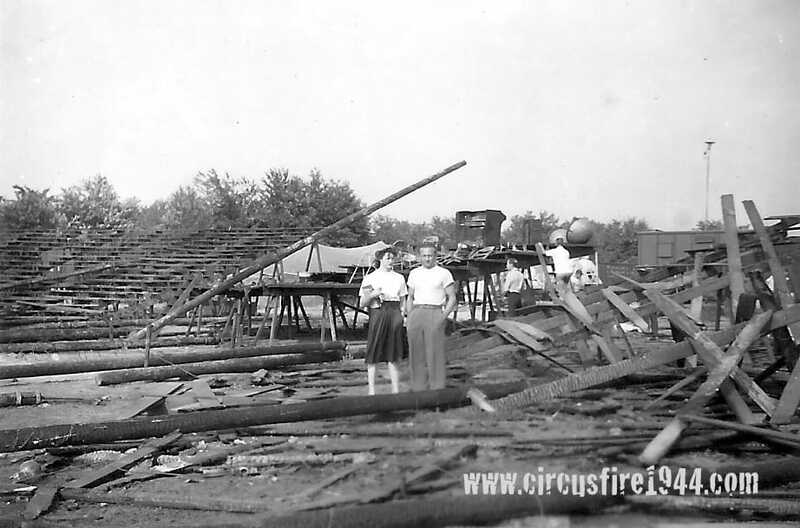 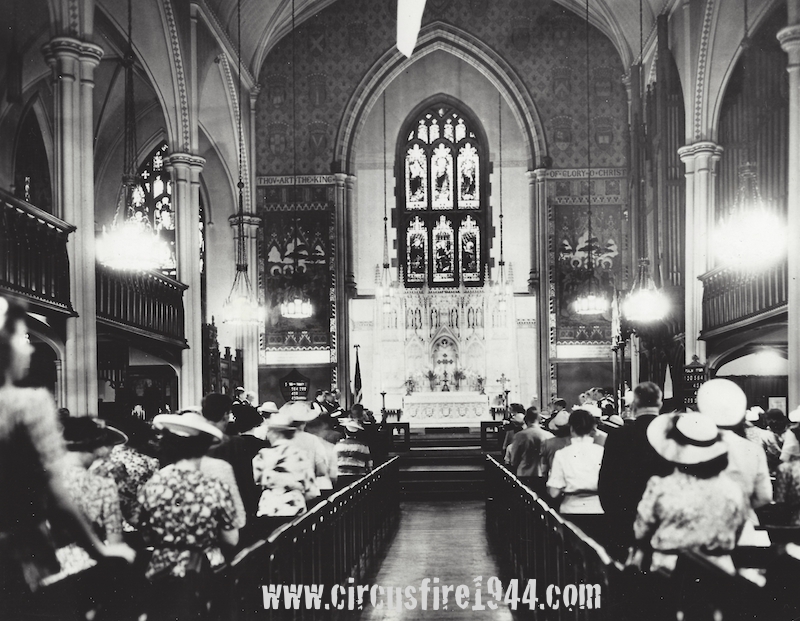 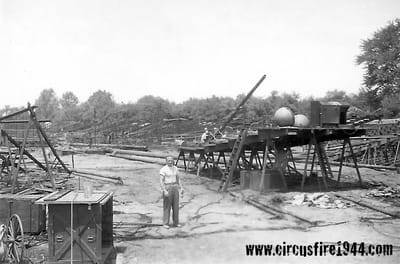 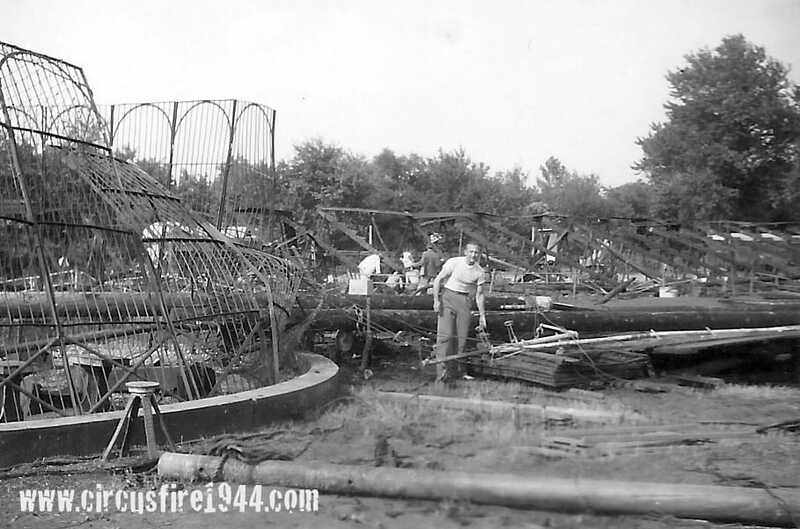 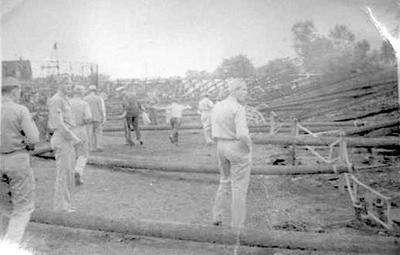 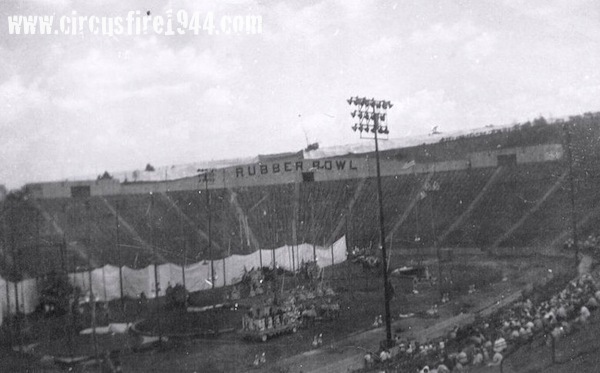 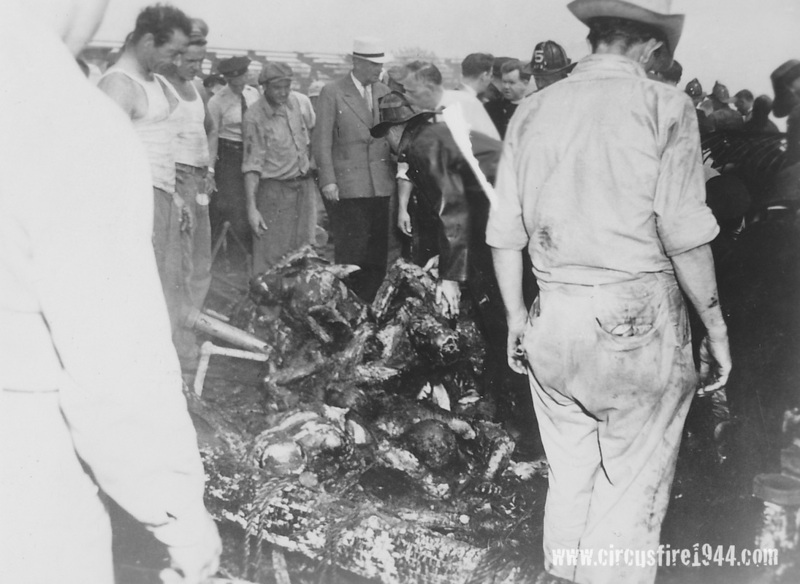 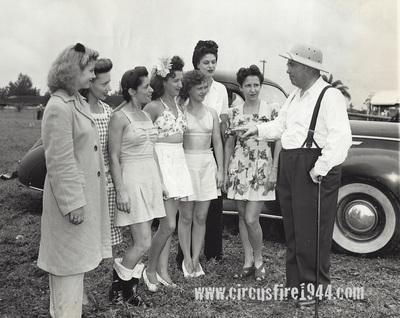 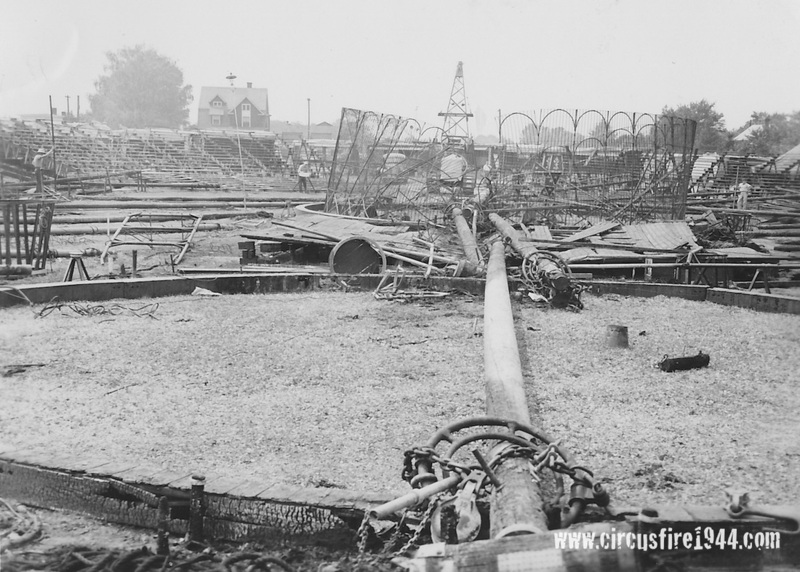 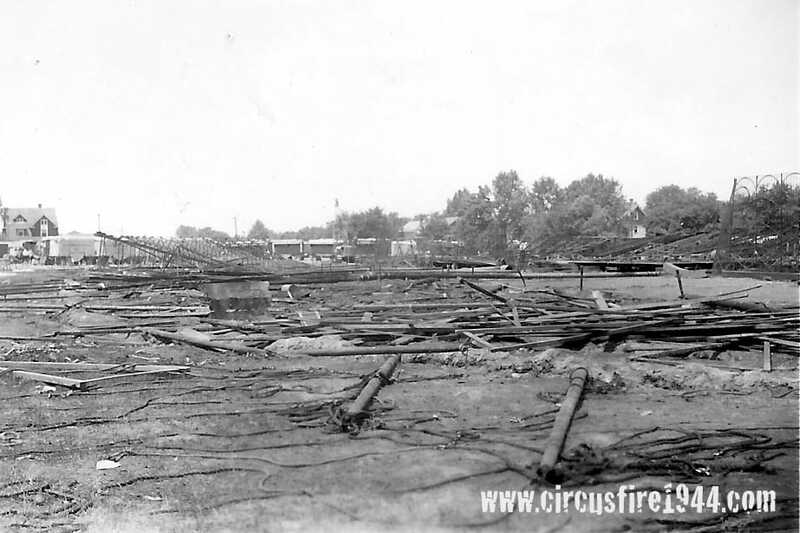 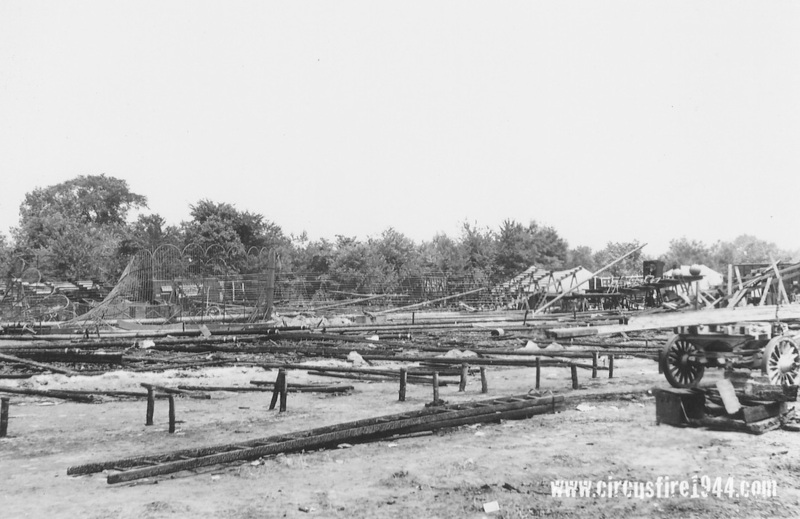 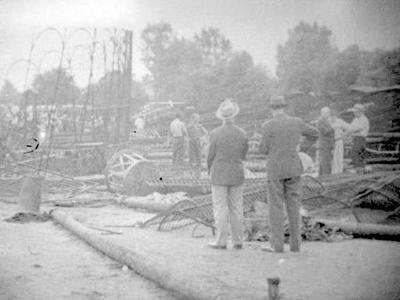 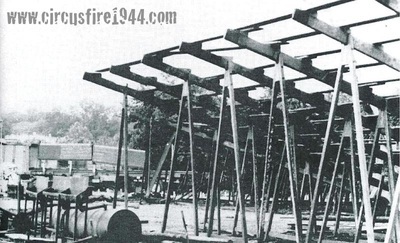 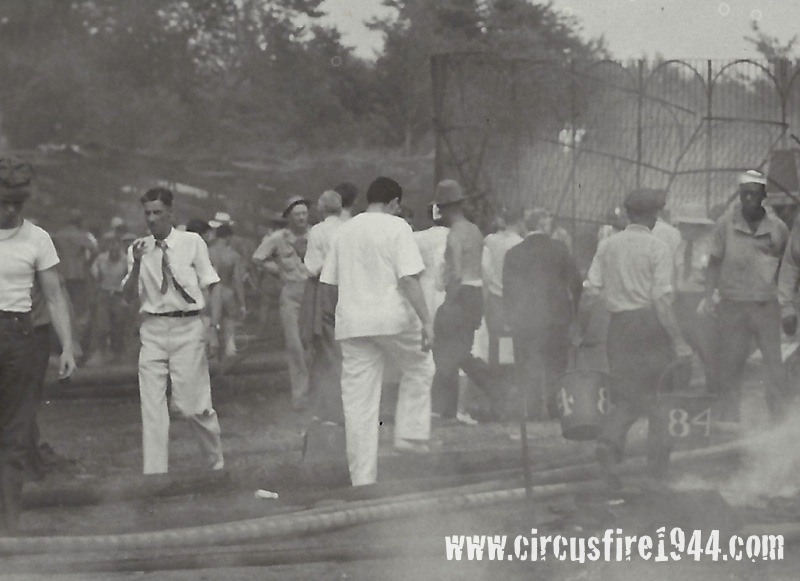 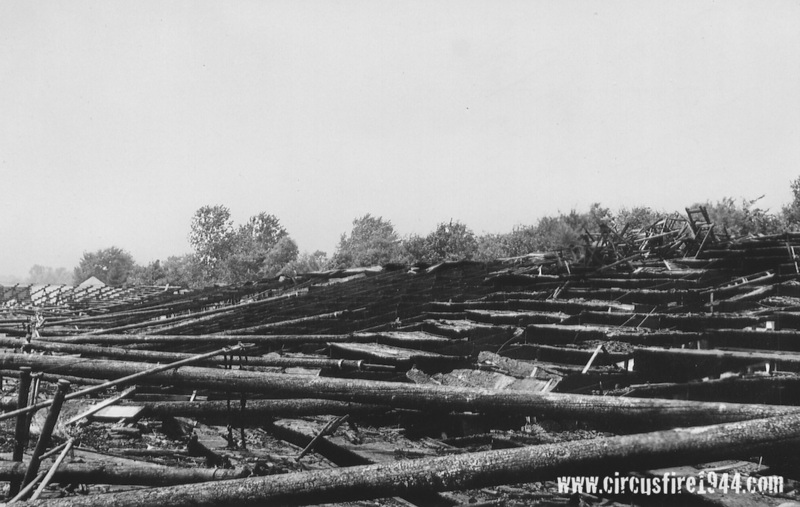 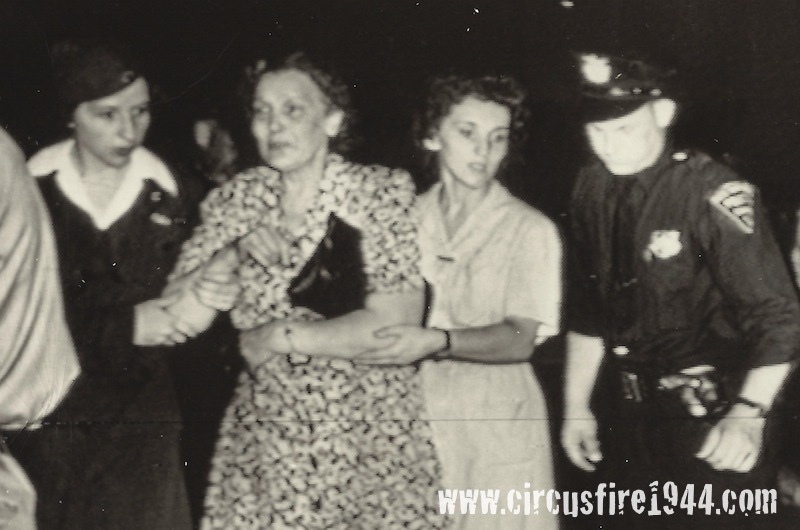 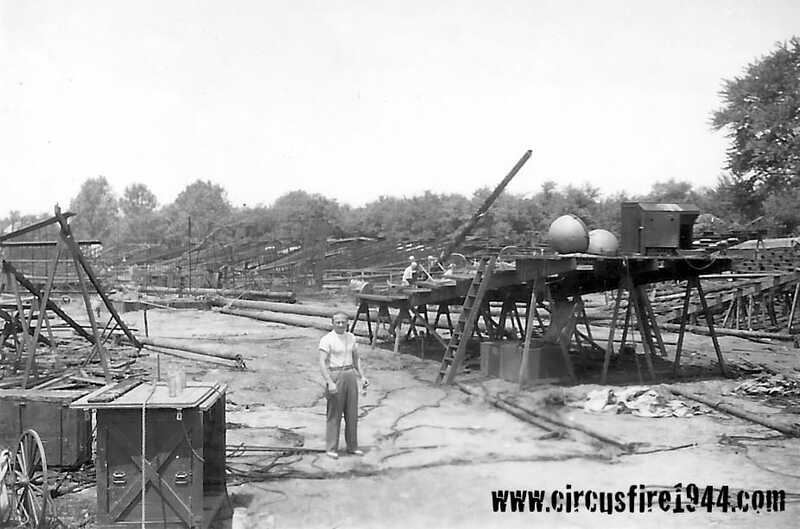 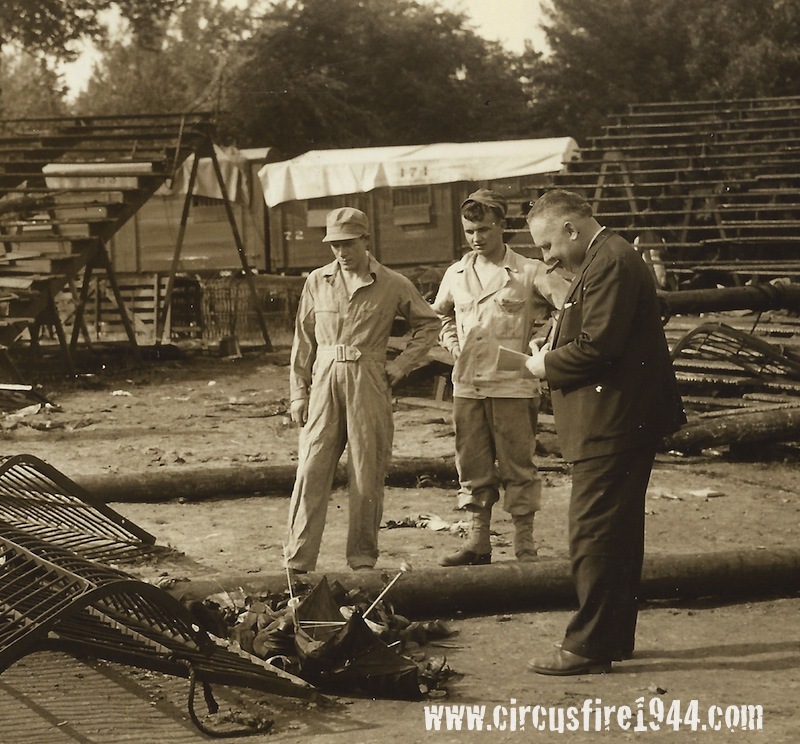 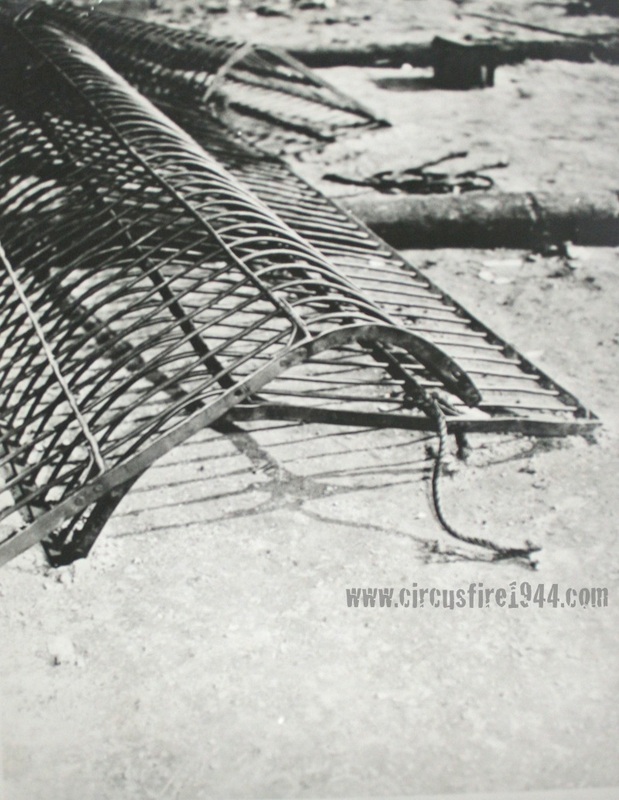 The Ringling Brothers and Barnum & Bailey circus first performance after rebuilding from the fire was at the Rubber Bowl in Akron, Ohio on August 4th. Images below show the workers setting up for the show. 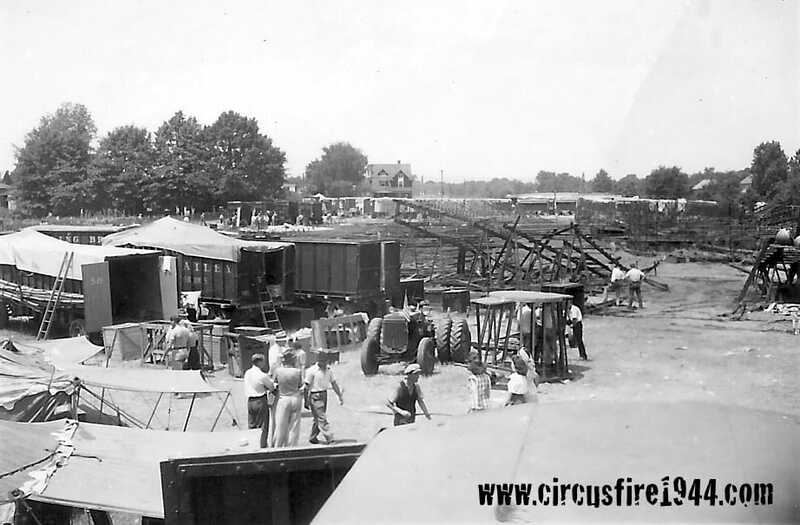 July, 1959 AP Newsfeatures photo: At top is photo taken just after the disastrous July 6, 1944 Ringling Bros. & Barnum and Bailey circus at Hartford, Conn. Below is a recent photo of the same area. 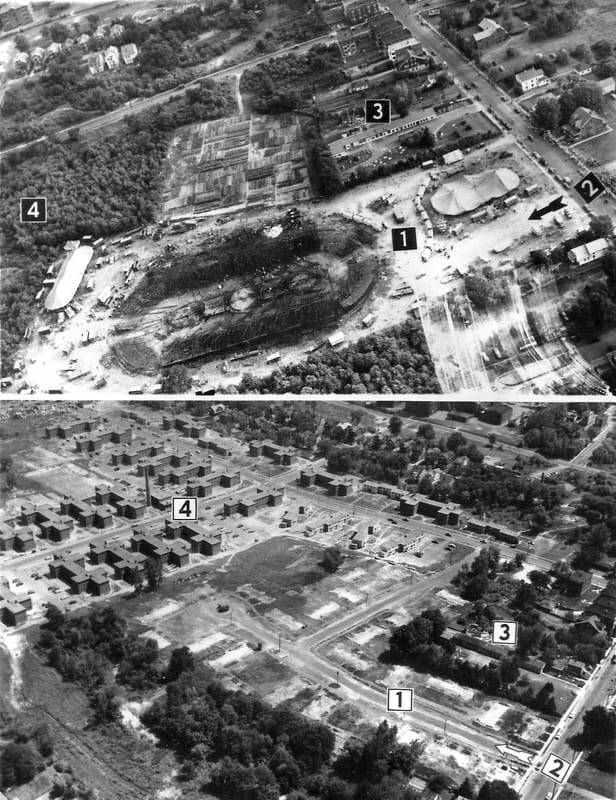 The numbered areas show  where the big top stood,  the entry from Barbour Street,  a stone works, and  new apartment buildings.